In this annual “Reflections” piece, we assess the state of the diabetes field going into 2019. We look back on 2018 in diabetes therapy, diabetes technology, big picture topics, and obesity to note scientific strides and surprises, to celebrate progress and take stock of remaining challenges, and to identify pressing questions for the year ahead. We also for the first time take a closer look at NASH and NAFLD, given the activity of much of the field in looking at these conditions. Within each section, you’ll find themes, a list of highly-read reports, what we did not expect or got wrong in 2018, key questions for 2019, and company-by-company updates for the most meaningful players on what’s coming in 2019. This Reflections piece is our favorite to write all year – and that’s up against the 999 other reports we’ve published since January 1, 2018! Indeed, the field of diabetes seems to move faster with each passing year, and positivity surrounding scientific and technological advances is balanced by the ever-growing burden of diabetes on patients and the healthcare system. We also perceive the field as harder and harder to work in, from an industry perspective, both for small companies as well as larger ones. We were very happy to see individualized and patient-centered care become the expectation over the last year; that said, the degree to which those expectations are closer to reality for the average patient is still very far away. While there are many things people “know” to be true without a doubt, making these things “true” for patients are far from standard of care – we discuss throughout the report and particularly in the conclusion about what we’d like to see change. Although medicine (therapy and technology) has improved at an unprecedented rate, healthcare systems throughout the world have evolved on the slower side. While there is reason to be optimistic about the future of diabetes care, in terms of what is possible, it has become harder and harder to work in the field and there’s a growing gap between what is possible and what the status quo is for patients all over the world. At the same time, 14% of adults in the US are living with diabetes and 40% are living with obesity – and as people live longer with these diseases, the cost diabetes leverages on the economy will continue to grow. Here are some “quick takes” on therapy, technology, obesity, NASH, and “big picture” and some themes to get you started! Diabetes Therapy: In another big year for CVOTs, 2018 further refined our understanding of diabetes drug classes. For GLP-1 agonists, positive HARMONY results (for GSK’s discontinued Tanzeum) surprised the field while driving it toward greater consensus on cardioprotection as a class effect. Meanwhile, topline REWIND results (for Lilly’s Trulicity) raised the possibility of primary cardioprotection with GLP-1s – a potential game-changer in diabetes management. Similarly, DECLARE results for AZ’s SGLT-2 inhibitor Farxiga demonstrated heart failure benefit in a majority primary prevention population (a thrilling first for the class! ), and we’re looking forward to a novel indication (hopefully extending to patients without CVD) in 2019. Despite growing consensus on cardioprotective class effects for both GLP-1s and SGLT-2s, we heard increased criticism of the heterogeneity between and low generalizability of CVOTs – reaching an interesting boiling point at an October FDA Ad Comm on the current status of the agency’s CVOT requirement. It was also a banner year for type 1 diabetes: Two sets of regulatory submissions for the first-ever oral adjunct therapies (AZ’s Farxiga and Sanofi/Lexicon’s sotagliflozin) made it to FDA and EMA, and we look to a January 17 Ad Comm on the latter. We also saw increased investment in type 1 cures (both Lilly and Novo Nordisk have entered beta cell replacement) and glucose-responsive insulin (JDRF, Novo Nordisk), but this is balanced against middling progress on type 1 prevention and other disease-modifying therapies. The past year also featured movement in biosimilar insulins: Merck pulled its biosimilar glargine due to unfavorable market dynamics after receiving tentative FDA approval/full EMA approval. Sanofi launched the first-ever biosimilar mealtime insulin (Admelog). Biocon/Mylan remain dedicated to their biosimilar glargine (Semglee), and Novartis has very recently entered the biosimilar space as well. Also on the horizon is next-gen glucagon, as we anticipate regulatory decisions for both Xeris’ G-Pen and Lilly’s nasal glucagon in mid-2019, following closely-spaced submissions in 2018. Slightly further back in the pipeline are dual agonists: The big story for 2018 came from Lilly’s tirzepatide, which made waves at EASD 2018 and has already entered phase 3 for type 2 diabetes. See all 12 therapy themes below. Diabetes Technology: 2018 was headlined by tremendous expansion for the CGM category – we estimate ~1.5 million CGM users worldwide (nearly doubling year-over-year), with global sales nearing ~$3 billion in 2018 (over 70% YOY growth). The field has hit a true inflection point, led by a standout year for Abbott’s FreeStyle Libre and Dexcom’s G6. In the US, the standalone CGM product landscape doubled from the start of the year to the end (two to four products), and all four current CGMs in the US were not even available at the start of 2018 – Abbott FreeStyle Libre 14-Day version, Dexcom G6, Medtronic Guardian Connect, and Senseonics Eversense. Closely tied to CGM was impressive momentum for interoperability: the clearance of Dexcom’s G6 under a new, lower-risk 510(k) path for “integrated CGM” (iCGM); earlier-than-expected approval of Tandem’s Basal-IQ with the G6 iCGM; four pump companies joining JDRF’s open protocol initiative (Roche, SOOIL, SFC Fluidics, and Ypsomed); and Tidepool’s exciting plans to submit the DIY Loop app to FDA, opening up a new path for automated insulin delivery (AID) – three plug-and-play components that users can mix-and-match together (smartphone app, interoperable pump, interoperable CGM). On that note, our AID Competitive Landscape was the year’s #1 most-read Closer Look report. Indeed, there was solid progress in 2018: the MiniMed 670G hit more scale (>135,000 active users, up six-fold); Basal-IQ brought the first no-calibration, remote-software-updateable AID system; CE Mark approval came through for both 670G and Diabeloop (plus Health Canada for 670G); and companies drove towards AID via smartphone pump control. Insulet announced it will integrate with Tidepool Loop and push its own Horizon system forward, now with smartphone control and a Samsung partnership. The smart insulin pen/cap landscape saw faster movement too, headlined by commitments from Novo Nordisk and Lilly to launch their own connected pens (NN launches in 2019; Lilly will submit to FDA in 2019). As connectivity makes it into every device, we expect to see faster innovation (more pushed to software, where iteration is quicker and less costly), more insightful remote monitoring and coaching (a big theme this year), and miles better insulin-dosing decision support. The companies that best capture and harness data (outcomes, costs) will win in this fast-paced ecosystem. See all 12 tech themes below. Big Picture: Reports in 2018 demonstrated that diabetes prevalence and associated costs continue to climb. Most notably, a September publication from CDC that revealed US diabetes prevalence has hit 14% – up from 12.3% in the last such report from 2014. What’s more, ADA’s biannual cost of diabetes analysis showed that US diabetes-related spending hit $327 billion in 2017, climbing 26% from 2012. On a more encouraging note, the past 12 months have been big for the Beyond A1c movement, with new data on validating CGM-based outcomes. Most notably, Dr. Roy Beck presented (and later published, with colleagues) a DCCT post-hoc analysis linking time-in-range, based on seven-point SMBG, to retinopathy and microalbuminuria. Outcomes Beyond A1c figured into every major conference in 2018, which should only accelerate in 2019. Changing treatment algorithms from ADA, EASD, and ACC made groundbreaking recommendations on CVD, HF, and CKD management; the ADA took unprecedented (if early) steps toward tackling therapeutic inertia; and there are now eleven CDC-recognized digital DPPs. We also saw new debates emerge, including over the role and reliability of real-world/Big Data in diabetes (ADA Consensus is forthcoming) and on the definition and feasibility of diabetes remission/reversal. Still, other areas have not changed fast enough, most prominently insulin pricing and accessibility; here, 2018 was a year of multiple calls to action and but little tangible progress. See six themes below. Obesity: The year in obesity saw continued challenges balanced by optimism for the future of pharmacotherapy. This came on a backdrop of concerning prevalence data: CDC’s yearly state-level data indicated that seven states had a self-reported obesity rate above 35%, up from five states in 2016. Compounding concern over obesity prevalence inching ever-higher, the commercial market also saw challenges. On top of poor sales performance save for Novo Nordisk’s Saxenda, 2018 included Orexigen filing for bankruptcy, Arena/Eisai further deprioritizing Belviq in favor of a new Alzheimer’s candidate, and the CAMELLIA CVOT for Belviq reading out with CV neutrality and underwhelming weight loss. Is there hope? Near-term, excitement for semaglutide’s potential in obesity was abundant in 2018, and the phase 3 STEP program (2020 completion) and SELECT CVOT (September 2023) for high-dose semaglutide both began recruiting. Elsewhere in the obesity drug landscape, dual agonists showed promise. Indeed, Lilly announced plans during its 2019 investor meeting to bring much-hyped GLP-1/GIP dual agonist tirzepatide into phase 3 for obesity in 2019. We also hope to see Sanofi’s GLP-1/glucagon dual agonist enter phase 3 in obesity soon, though this program has been delayed by unexpected tolerability concerns. See three themes below. Leaving the year, we were struck by this Farnam Street blog post: “What’s Staying the Same?” It notes that the usual question – “What’s going to change in the next 5-10 years” – is not nearly as useful as its opposite – “What’s going to stay the same in the next 5-10 years?” Focusing on the latter, as Amazon’s Jeff Bezos has noted, is where lasting businesses are built. From our view, the quadruple aim is what will unquestionably stay the same – the need to enhance the patient experience, improve population health, reduce costs, and improve the work life of healthcare providers. In 2019, we look for tangible progress in access and affordability, improvements in healthcare delivery and patient support, and sustained innovation in both therapeutics and technology. 5. Remote, Connected Care Expands to Target Diabetes, BP, Weight, Behavior Change: Livongo, Omada, Welldoc, mySugr, One Drop, Virta, etc. 7. Decision Support for MDI Users Gets Far More Attention; What Kind of Outcomes Should We Expect? Why Hasn’t Basal Insulin Titration Taken Off? 10. Hospital – The Next Frontier for CGM and Automated Insulin Delivery? Is Tanzeum (albiglutide) the overlooked GLP-1 that could? Tanzeum’s surprise positive readout from the HARMONY CVOT drove greater consensus on cardioprotection as a GLP-1 class effect, independent of metabolic benefit. This was one of the more unexpected twists in recent history, because despite being recently discontinued by GSK due to subpar glycemic/weight loss efficacy (as reflected by sluggish sales), albiglutide reduced risk for three-point MACE by 22% vs. placebo. HARMONY results at EASD thus advanced the conversation on cardioprotection as a class effect for GLP-1, mediated independently of metabolic effects. Following the HARMONY readout, which showed significant CV risk reduction despite middling effects on metabolic outcomes including A1c-lowering and weight loss, thought leaders coalesced more strongly around the idea of cardioprotection as a class-effect of GLP-1 agonists – or, at least, long-acting GLP-1 agonists. As though leaders Drs. Dan Drucker and John Buse put it, HARMONY provides the strongest evidence yet of the dissociation between (i) lowering glucose and body weight and (ii) reducing CV events; rather, cardioprotection seems to be directly mediated through the GLP-1 receptor. Results from the highly anticipated REWIND (for Lilly’s Trulicity) and PIONEER 6 (for Novo Nordisk’s oral semaglutide) trials further cemented the class’ cardioprotective effects in 2018 (more on these below). Despite the emerging consensus around cardioprotection, metabolic effects including A1c lowering and weight loss are still crucial in differentiating the increasingly competitive GLP-1 class. Treating hyperglycemia and driving meaningful weight loss are still important goals to strive for in diabetes care, especially when it comes to reducing microvascular complications. Lowering body weight mitigates long-term CV risk as well, and we know it enhances patient quality of life and can even improve medication adherence. For all of the discussion around cardioprotection, we’re also hearing important reminders not to forget the “legacy” benefits of better glucose lowering and weight loss. Moreover, weight loss and glucose lowering remain highly important factors for patients, and ones that have proven critical for commercial success of a GLP-1 therapy. On this note, 2018 laid bare that innovation is key for success in the increasingly-competitive GLP-1 class. Given that cardioprotection may become the new baseline standard going forward, innovation in terms of better glucose lowering, weight loss, methods of delivery, and pricing will be key in determining the future direction of the class. Oral semaglutide is poised for regulatory submission in 2019, likely bringing the first-ever oral GLP-1 to market by 2020, at least. Topline results for all 10 trials of the phase 3 PIONEER program were released in 2018, beginning with topline results from PIONEER 1 in February. Indeed, Novo Nordisk filled 2018 with a flurry of activity in the PIONEER program, and results from each of these trials were positive across the board. As a whole, PIONEER results demonstrated that oral semaglutide can confer efficacy that nearly equals that of its injectable counterpart (Ozempic), with tolerability on par with current GLP-1 options. The past year saw ever-building excitement for the potential this oral formulation has to diversify patient choice. From where we stand, if there has been any disappointment with oral semaglutide, it was a very narrow miss on CV superiority in PIONEER 6 – reportedly, only a couple of MACE events made the difference (per Dr. Tina Vilsbøll at WCTD 2018). It’s important to keep in mind that superiority was never expected of the trial (the shortest and smallest GLP-1 CVOT to date), so these results are still highly impressive. The disappointment comes in that we’ll probably have to wait a few more years to recognize a CV indication for oral semaglutide. We should note that there have been some concerns circulating with regard to fasting requirements surrounding each oral semaglutide dose, but we imagine that many patients will happily agree to take the pill in a fasting state each morning and to refrain from eating for 30 minutes thereafter, in exchange for the incredible efficacy of a GLP-1 agonist in a more convenient, friendly, needle-free form. (For those patients who don’t want this, a once-weekly injectable GLP-1s would still be a desirable option – hence the major win for therapeutic choice.) Novo Nordisk plans to file oral semaglutide for regulatory approval in the US and EU in 1H19. The company is also evaluating the potential to use the combination of SUSTAIN 6 and PIONEER 6 data to obtain a CV indication for Ozempic (injectable semaglutide). However, a CV indication for oral semaglutide will likely require another full-fledged post-market CVOT. Expectations are sky-high for this first oral GLP-1: Some analysts believe that oral semaglutide, could, once established on the market, achieve $5 billion (!) in annual revenue. For context, the current market-leading Victoza brought in ~$3.6 billion in sales in 2017. REWIND results could open the door for use of GLP-1s for cardioprotection in lower-risk patients (“primary prevention”). Lilly’s REWIND was perhaps the most ambitious GLP-1 CVOT to date, enrolling a substantially lower-risk population than other trials: Only 31% of participants had baseline CVD, compared to 73%-100% for all other GLP-1 CVOTs; baseline average A1c of 7.3% was also much lower than other GLP-1 CVOTs. To balance this, median follow-up in REWIND was much longer than average at 5.4 years, further supporting long-term safety of Trulicity (dulaglutide). While we know that Trulicity significantly reduced risk of three-point MACE vs. placebo, we don’t know how that effect was balanced between primary and secondary prevention groups, because only topline data has been released thus far. Consequently, it’s possible that REWIND supports the use of Trulicity, and potentially other GLP-1s as well, to prevent CVD in the first place, not just to prevent subsequent CV events in those who have already had them – a tremendously exciting development! We’ll have to wait for full results at ADA 2019 to know for sure whether REWIND supports a primary prevention indication, and it is certainly possible that REWIND’s superiority was driven by its effect in the secondary prevention cohort, as Dr. Philip Home aptly pointed out to us in his commentary on topline results. That said, some thought leaders have aligned in their thinking that CV benefits of GLP-1s should extend to lower-risk patients. With a hypothesized anti-atherosclerotic mechanism that confers risk reduction gradually over time, it’s wholly possible that GLP-1s given for a long duration could provide substantial cardioprotection regardless of established CVD presence. Our sense is that the field is waiting with bated breath for full results on this potential paradigm-shifter in how GLP-1s are used in clinical practice. The GLP-1 class is more competitive than ever, and major players continue to make serious investments in developing novel GLP-1 therapies. GLP-1s are a hotbed for innovation within the broader diabetes landscape, and 2018 saw major manufacturers double-down on the class with further investments in the potential next generation of GLP-1s. In September, Lilly added a phase 1-ready oral GLP-1 to its pipeline in a licensing agreement with Chugai Pharmaceuticals. The company holds this candidate in high regard and touted its potential to eventually out-compete Novo Nordisk’s oral semaglutide on its 3Q18 earnings call. Importantly, this candidate is non-peptidic in nature and could potentially circumvent the common bottleneck of poor bioavailability due to gut degradation associated with peptide oral GLP-1s, such as semaglutide, as well as the need for fasting. Notably, vTv has taken a similar approach with its non-peptidic oral GLP-1, which is currently in phase 2b and is the closest competitor to the likely first-to-market oral semaglutide. Novo Nordisk also added another oral GLP-1 to its early stage pipeline in 3Q18. This next-gen oral GLP-1 comes from the same series of compounds that led to semaglutide and presents two exciting possibilities: It could either be dosed to give higher efficacy than oral semaglutide, or efficacy could match oral semaglutide but come at a lower price. What’s more, a recent update from Intarcia indicates that implantable exenatide mini-pump ITCA 650 is on track for re-submission to FDA in mid-2019, potentially bringing a strong solution to adherence issues to market in 2020. Certainly, we’re glad to see innovation that could further expand patient choice within GLP-1s and help to make these stellar agents available to patients at a lower cost. Despite the immense success the GLP-1 class has enjoyed to date, it’s clear that significant untapped potential remains (starting with the fact that only a minority of adults with type 2 diabetes ever get to try a GLP-1 agonist). Commercially, it was another banner year for GLP-1s, with the class posting >$2 billion in quarterly sales for the first time in 3Q18. Even from a high base, the GLP-1 class continues along a striking growth trajectory, consistently posting high double-digit YOY growth: +30% in 1Q18, +20% in 2Q18, and +30% in 3Q18. Similarly, total prescription volume for GLP-1s showed no signs of slowing down in 2018. At the core of this success is the continual innovation manufacturers have brought to the class, not only in terms of molecules but also in terms of delivery methods (i.e., with autoinjection), as well as the inherent physiological benefits GLP-1s offer (e.g., weight loss, very effective glucose lowering, beta cell preservation). GLP-1s now offer friendlier once-weekly dosing schemes, evidence of cardioprotection, patient-friendly injection devices, and significant clinical benefits in terms of A1c lowering and weight loss – and the forthcoming arrival of oral semaglutide and possibly even Intarcia’s ITCA 650 will only bolster the innovative chops of this highly impressive class. For a deeper dive on the commercial dynamics of the GLP-1 market, see our 1H18 industry roundup and 3Q18 pooled analysis. The year saw slowed SGLT-2 inhibitor class growth following safety concerns (amputations in 2017, Fournier’s gangrene in 2018), but recent and coming developments should bring significant tailwinds. These include the recent ADA/EASD Consensus Statement explicitly recommending SGLT-2 inhibitors (along with GLP-1 agonists) for people with diabetes and ASCVD, the updated ADA Standards of Care, a third positive CVOT in DECLARE, US and EU MACE indications for J&J’s Invokana (canagliflozin), and the stopping of CREDENCE (renal outcomes trial for Invokana) ~one year early due to a clear showing of efficacy (meaning it was no longer ethical to keep people on placebo). Each event contributed to clinical optimism for the SGLT-2 class in the latter half of 2018. But given lingering safety concerns – furthered by new analyses – our optimism is measured for whether the class will return to more than single-digit annual class growth in the near future. (Longer-term, SGLT-2s could tap into an entirely new market with heart failure and/or renal indications separate from diabetes.) More than any other class this year, SGLT-2 inhibitors offered a tale of conflicting forces. In the shadow of the amputation signal from CANVAS (ADA 2017), a shocking Swedish registry study presented at ESC 2018 found a more-than-doubled risk of amputations with new SGLT-2 starts vs. GLP-1 starts (HR=2.32, 95% CI: 1.37-3.91). Of note, 38% of the SGLT-2 group was started on empagliflozin, 61% on dapagliflozin, and only 1% on canagliflozin. While we have heard from Dr. John Buse that this observational analysis may have methodological shortcomings beyond those normally present in registry analyses, some thought leaders, such as Helmholtz Centre’s Professor Eberhard Standl, have used the results as evidence that lower limb amputations are a likely class effect of SGLT-2 inhibitors (despite no signal in EMPA-REG OUTCOME or DECLARE). Given that only CANVAS saw an amputation signal, others (including Dr. Jay Skyler) have argued that the effect is isolated to Invokana, noting that this SGLT-2’s potency and ratio of SGLT-1 vs. -2 inhibition could be relevant. Based on what we’ve heard in 2018, there doesn’t seem to be a sharp consensus on the issue of amputations as a class effect. What we have noticed is strong agreement that any risk can be well-minimized by selecting patients who are not at high baseline amputation risk and through vigilant foot monitoring. Our sense, corroborated by falling Invokana sales, is that prescribers and PBMs/payers are shying away from Invokana in favor of Jardiance (Lilly/BI’s empagliflozin and the first diabetes drug to garner a CV indication on its label). That said, the amputation signal from CANVAS certainly drove a headwind against SGLT-2 class growth in 2017 and 1H18. In fact, SGLT-2s hit an all-time-low 6.5% YOY total prescription growth in the late summer, according to Lilly’s 3Q18 presentation (slide 30). At the same time, Lilly is also optimistic about the class’ growth potential: Management highlighted a recent uptick in prescriptions, hinting at increased utilization in more recent months. Also adding to SGLT-2 safety concerns in 2018 was a new class-wide warning from FDA for necrotizing fasciitis of the perineum (Fourier’s gangrene). The warning was based on 12 cases of the life-threatening bacterial infection in patients taking an SGLT-2 inhibitor between March 2013 (when the first class member was approved) and May 2018. While some may view a class-wide label change as a drastic measure for so few cases of a complication (the FDA warning noted that an estimated 1.7 million people in the US received a dispensed prescription for an SGLT-2 inhibitor in the US in 2017), we are very glad that this complication was identified and that this information is out to patients – awareness is key to preventing future cases. That said, we note that major news outlets (CBS, Drugwatch, Forbes) devoted considerably more time to this complication than they have to amputations (possibly due to the class-wide rather than molecule-specific signal – not that we are particularly sure the amputations are a signal only from Invokana since each trial was designed differently), and we hope that its perceived prevalence among prescribers and patients is not overblown. Our sense is that progression to such a severe complication could be prevented with better patient education and access to care. In spite of these safety concerns, a series of positive CV (DECLARE) and renal (CREDENCE) developments brought new energy to the SGLT-2 class, possibly contributing to an uptick to 9.5% YOY total prescription growth by the end of 3Q18 (and with no signs of slowing down – slide 30). Indeed, manufacturers in 3Q18 did seem more optimistic, agreeing that the ceiling for these therapies remains much higher and tailwinds are forthcoming. President of Lilly Diabetes Mr. Enrique Conterno identified both (i) the recently-published ADA/EASD recommendation to use SGLT-2s (or GLP-1s) as a second-line therapy for patients with type 2 diabetes and established atherosclerotic CV disease and (ii) growing consensus on cardioprotection as a class effect of SGLT-2s as seriously promising for the class. On the latter, we imagine Mr. Conterno was alluding to recent positive results from DECLARE for AZ’s Farxiga (dapagliflozin) as well as recent FDA approval of Invokana’s CV indication for reducing risk of three-point MACE in those with type 2 and established CVD. With DECLARE, the field now has primary-endpoint level evidence that SGLT-2s reduce risk of hospitalization for heart failure – and that benefit was consistent across primary and secondary prevention patients (a CANVAS post-hoc analysis also supports this claim). While DECLARE did not give a significant effect on three-point MACE (possibly due to the 59% primary prevention enrollment), AZ CEO Mr. Pascal Soriot underscored the financial upside to established benefit for heart failure specifically, which he asserted is as costly as cancer to the healthcare system. Lastly, the ever-increasing excitement for renal protection as a class effect of SGLT-2 inhibitors is surely promising, particularly as (i) CREDENCE was stopped ~one year early due to overwhelming efficacy and (ii) a 24% relative risk reduction (HR=0.76, 95% CI: 0.67-0.87) was observed on a renal composite endpoint in DECLARE. Results from AZ’s CKD trial, Dapa-CKD, are now expected in 2020, and Lilly/BI’s EMPA-KIDNEY is slated to complete in June 2022, which could further support this highly-important benefit and expand the market for SGLT-2 therapy. Continuing a trend from 2017, thought leaders placed ever-increasing emphasis on the importance of heart failure and CKD in diabetes, extolling SGLT-2s’ potential to hit a “sweet spot” for both, in patients across the entire spectrum of CV risk. As Dr. Javed Butler put it in his discussion following presentation of DECLARE results at AHA 2018, “regardless of what primary endpoint was chosen in these clinical trials based on the guidance from regulators, all CV outcomes are important to the patients and doctors, including CKD, HF, and MI and stroke – and, even worse, CV mortality.” He went on to assert that SGLT-2 inhibitors should be used in type 2 diabetes to reduce heart failure risk, irrespective of their effect on the classic three-point MACE. This opinion was fully captured by a comment in The Lancet authored by Dr. Subodh Verma contextualizing the use of SGLT-2 inhibitors in primary and secondary prevention populations based on all published SGLT-2 CVOTs, including DECLARE. In this comment, Dr. Verma argues that risk reduction for MACE events with an SGLT-2 seems to be limited to secondary prevention populations with established CVD, while the effect of SGLT-2 inhibitors in preventing heart failure hospitalizations and protecting renal function appears to apply across the entire CV risk spectrum – a prediction also voiced by Dr. Itamar Raz at WCTD 2017, and the importance of which should not be underestimated Dr. Butler reinforced this sentiment, reminding his audience that the primary and secondary prevention designations as well as three-point MACE as an endpoint stem from regulatory guidance and don’t necessarily reflect what is most important to patients or the healthcare system. To this end, he cited a 2010 article by the venerable Dr. Rich Bergenstal, which demonstrated that congestive heart failure (CHF) is the single-most prevalent complication in patients with diabetes relative to those without diabetes. Even worse, once patients with type 2 diabetes develop heart failure, their mortality risk skyrockets and fewer than 10% survive to five years, compared to ~80% of those with type 2 diabetes without heart failure. Bringing all of this together, Dr. Butler asserted that any quality improvement effort in diabetes care that does not consider HF and CKD will likely fall short of the potential benefit patients can receive, and any therapy indicated for improving heart failure outcomes (as dapagliflozin likely will be, based on DECLARE results) should be a welcome addition to the diabetes care armamentarium. As such, we were thrilled this year to see the ADA/EASD consensus statement, the ACC’s first-ever consensus statement on novel therapies for type 2 diabetes, and the ADA Standards of Care for 2019 recommend SGLT-2s as second-line therapies to metformin in those with CVD and predominant heart failure or CKD. SGLT-2 manufacturers have doubled down on efforts to prove HF benefit in dedicated outcomes trials. In 2018, AZ added the DELIVER trial (dapagliflozin in HFpEF) to complement its Dapa-HF (dapagliflozin in HFrEF) program, while Lilly/BI launched the EMPERIAL trials to investigate exercise capacity with Jardiance in heart failure (both reduced and preserved ejection fraction). These smaller (n=~300 each) studies could potentially provide an earlier indication of empagliflozin’s potential in a heart failure population, prior to readout of the larger (n=6,976 total) EMPEROR-Preserved and EMPEROR-Reduced expected in June 2020. Very notably, the EMPEROR trials as well as DELIVER and Dapa-HF are enrolling participants with and without type 2 diabetes, presenting the tantalizing prospect of a dedicated heart failure indication for SGLT-2 inhibitors. This treasure trove of data inspired many discussions among thought leaders across the conference circuit in 2018. Every potential therapy comes with risks and benefits. With SGLT inhibitors in type 1 diabetes, how to balance the benefits (A1c lowering, weight loss, greater time-in-range, reduced insulin requirements) vs. the risks (increased DKA) was and still is a lightning rod for discussion. Notably, on the first day of ADA 2018, ATTD and Prof. Thomas Danne convened 30 thought leaders to discuss DKA risk mitigation with SGLT use in type 1s, and the consensus that emerged from this meeting resulted in a manuscript on best practices for minimizing DKA risk, to be published soon in a scientific journal. As these therapies march toward hopeful regulatory approval, the conversation will surely burn on. An FDA Advisory Committee meeting for sotagliflozin on January 17 should reveal how regulatory agencies are approaching these agents’ risk/benefit profile as well as the most current HCP perspectives on their use. Of note, EMA/CHMP held a closed-door meeting in November 2018 to weigh in on the approval of SGLT inhibitors for type 1 diabetes, but our understanding is that they have neither reached nor announced a final decision and will hold off until after the FDA meeting. In our view, there were important areas of consensus surrounding SGLTs for type 1 that emerged in 2018: The benefits are clear, their utility in meeting a huge unmet need in type 1 is apparent, and although elevated DKA risk is real, we strongly believe it can be managed with improved patient and provider education, proper patient selection, ketone monitoring, and other measures. From where we stand, the critical issue is implementation of those risk management procedures, since so many type 1s are already taking SGLT-2s off-label. It’s been fascinating to track the narrative of SGLT use in type 1 patients over the years, from uncertainty and mixed feelings in 2016, to “renewed promise” in 2017, and finally to coalescence into the relative consensus seen today as these agents stand to face their reckoning with regulatory agencies in the year(s) to come. The composite of data between the inTandem, DEPICT, and EASE programs points toward a consistent dose-dependent effect on both the benefits and risks associated with adjunct SGLT use. Importantly, full results from EASE reported at EASD 2018 confirmed the dose-response relationship seen in the two other phase 3 programs for SGLTs in type 1. Across all three programs, higher doses have given numerically higher levels of efficacy in terms of A1c lowering, time-in-range improvements, insulin dose reductions, and weight loss (we point toward this excellent commentary and synthesis of trial data recently published in Diabetes Care). Nevertheless, this elevated efficacy with higher doses is accompanied by an apparently increased risk of DKA: Higher rates of DKA were reported with higher doses of empagliflozin in EASE and sotagliflozin in inTandem, while rates were relatively consistent across doses in the DEPICT program for dapagliflozin. EASE results demonstrated that a lower 2.5 mg dose of empagliflozin did not result in elevated DKA rates when compared to placebo, further strengthening this dose-dependent relationship while also complicating the risk/benefit tradeoff of adjunct SGLT use. Although the lower dose still provided statistically significant benefits on A1c lowering, time-in-range, and weight loss, these improvements were noticeably reduced when compared to higher doses: the 2.5 mg dose conferred an ~0.3% A1c reduction, compared to ~0.5% with the 10 and 25 mg doses. This finding serves as an interesting and important lens through which to examine the tradeoff between DKA risk and efficacy. If this relative elimination of DKA risk is real with lower doses of SGLTs (whether this is truly the case is still up for debate, as EASE 3 was small in scale and was by no means definitive), will patients and providers view its efficacy as meaningful enough to warrant use? We imagine that the answer to this question will vary from patient to patient; given that nothing has been determined on reimbursement for type 1, it’s even harder to say. To be sure, we remain steadfast in our view that the benefits of SGLT adjunct therapy are clear and necessary in terms of meeting an area of tremendous unmet need. We acknowledge that DKA is a very real concern, but we continue to believe that proper education and monitoring can help to successfully mitigate this risk. Access to ketone monitoring is very important as is ongoing assessment for potential complications that haven’t even come up for type 2, but that may be more frequent in type 1 like bone fractures (Dr. Irl Hirsch will be writing to FDA about this as we understand it). Discussions around SGLTs in type 1 have both leveraged the power of and pushed forward the outcomes beyond A1c movement. Perhaps more than any other use case of diabetes therapy before, adjunct SGLT use for type 1 diabetes has focused on beyond-A1c benefits of SGLTs for patients. Sanofi/Lexicon sponsored an unbranded, beyond-A1c focused booth at multiple major meetings in 2018, educating providers on the importance of time-in-range as a metric. SGLT adjunct therapy of course does lower A1c, and phone survey data at EASD 2018 demonstrated positive patient experiences and feelings from the inTandem program. All in all, there has been a significant emphasis on the benefits SGLTs provide in terms of increasing time-in-range, reducing body weight, and easing the emotional burden of living with type 1 diabetes, at least as great as the emphasis on lowering A1c. We’re surely glad to see manufacturers thinking beyond A1c when communicating the benefits that this adjunct therapy offers. Excitingly, all three phase 3 programs for SGLT use in type 1 have leveraged CGM in clinical trials to demonstrate time-in-range improvements. We hope that this focus on outcomes beyond A1c continues and builds toward a type 1 CVOT in the near future. Calls for a CVOT in type 1 reached a new high in 2018: We heard several KOLs support the notion with renewed fervor, including Dr. David Cherney at ADA 2018 and Drs. Julio Rosenstock and Thomas Pieber at EASD 2018. Included in this commentary was the fact that type 1 patients are drawn to adjunct SGLT use not only for the A1c and time-in-range benefits, but also for potential organ (specifically heart and kidney) protective effects that have been established in type 2. HCPs have shared that patients come in specifically citing CV benefits with SGLT-2s; as Dr. Anne Peters put it, adults with type 1 have heard of the CV benefits in type 1 and they want to experience the same. Mechanistically, there’s ample reason to believe the effects of SGLT inhibition could confer similar benefits in type 1 patients as well, and we even saw promising renal data from DEPICT to this end. Nevertheless, long-term outcomes studies are needed to prove any benefit and to get these claims into drug labels, which would also greatly bolster the number of people with type 1 diabetes who reap these micro and macrovascular benefits. A recent commentary penned by ADA’s Dr. Will Cefalu and Dr. Matthew Riddle calls for longer-term studies to be conducted in order to determine potential renal and cardioprotective effects in type 1s. Outside of SGLT inhibitors, 2018 also saw results from the EMERALD study presented, suggesting possible CV benefit to metformin in youth with type 1 diabetes. To be sure, the study was small (n=49), but did find improvements in insulin resistance, aortic function, carotid intima media thickness (cIMT), and body composition with metformin in type 1 individuals 12-21 years-old. Type 1s undoubtedly face increased CV risk, and it’s imperative moving forward that adequately powered long term outcomes trials investigate the potential effects of metformin, GLP-1s, and SGLT-2s in this population. Substantial off-label usage of SGLT inhibitors underscores the need for regulatory action and an important upside of approval. We learned from Dr. John Buse at CMHC 2018 that ~4% of US type 1 patients are currently using SGLT inhibitors off-label – meaning that over 50,000 type 1s are already using these agents. People with type 1 clearly value the benefits of adjunct SGLT use, and anecdotal evidence from prescribers appears to indicate that DKA events do not greatly faze these patients (nor their providers) in the pursuit of improvements in A1c, time-in-range, and psychosocial diabetes burden. As the prevalence of off-label usage will likely continue to climb, the need for regulatory action will only become more apparent: Formally regulating use of SGLTs in a type 1 population can only make the practice safer, and we struggle to imagine that regulatory agencies denying approval in type 1 would prevent off-label use. Moreover, we’ve often heard the point made that DKA is still far more common than it should be, and this entire movement could help to bring much-needed attention to the issue. Still, implementation of best practices for use if and once approved is essential, and there remain more questions than answers on this front. Merck’s decision not to commercialize Lusduna (biosimilar insulin glargine), which had already been FDA-approved pending resolution of Sanofi’s patent infringement lawsuit, came as a late blow in biosimilar insulins. In our view, this move reflects the substantial barriers to success in today’s insulin market. In October, Merck and Samsung Bioepis announced the end of their partnership for the worldwide commercialization of Lusduna, which would have been the second-to-market biosimilar basal insulin after Lilly/BI’s Basaglar. This termination was especially notable, seeing as Lusduna was on the cusp of reaching the market, with approval in the EU and tentative FDA approval already secured. Merck could have waited until March 2019 for the launch of its Lusduna pen (after expiration of the 30-month stay triggered by the Sanofi lawsuit) to collect revenue from the franchise. However, the decision to altogether terminate commercialization before this point speaks volumes to the pressures that continue to deflate investment in the diabetes field and in insulin in particular – the companies said as much in their announcement of this decision. Production set up for biosimilar insulin is expensive, as are maintenance, quality control, and registration in multiple jurisdictions. Further looming over these formidable barriers is the prospect of ever-declining realized prices due to intense pricing pressure within the insulin market. PBMs/payers negotiate high rebates from insulin manufacturers because they view all insulins as more or less the same, and they design exclusive contracts that restrict patient choice. The fact that a diabetes giant such as Merck could not justify the commercialization of a biosimilar insulin casts serious doubt on the future success of the field, much to the chagrin of patients and healthcare systems that are both in desperate need of more affordable insulin options. To be sure, the market entry of Lusduna would have been an immense win for patients and for the entire healthcare system – we’ve heard that it takes two or more biosimilars to meaningfully drive down out-of-pocket costs – and we can’t overstate our disappointment that Lusduna won’t be hitting pharmacy shelves. Many companies have left diabetes over the last several years or have invested far less – these include, among others, Allergan, BMS, Gilead, GSK, Takeda, and others. We were happy to see Merck partner with NGM Bio recently although we aren’t yet sure how confident they are about potential type 2 diabetes treatment. This year saw the market entry of the first-ever biosimilar mealtime insulin, Sanofi’s Admelog. Mylan/Biocon’s Semglee is next up in the biosimilar basal pipeline, and Novartis recently announced an exciting entry into this class. All of this is to say that, despite the substantial barriers, manufacturers are still pursuing new insulins – though the bar is most certainly higher. Sanofi has been quite positive about Admelog’s early performance, namely in the Medicaid segment; the product grossed $30 million in its first quarter of reported sales in 3Q18. Semglee (biosimilar insulin glargine) became available in European markets starting with a UK launch in November, following EMA approval in March. A US launch isn’t expected until early 2020, as the Mylan/Biocon’s initial NDA received a CRL in June 2018, reportedly due to a change in manufacturing facility – bridging studies will have to be completed before resubmission, which is anticipated in 2019. While Semglee’s introduction into European and US markets should eventually help to drive down insulin costs, Mylan/Biocon’s relative inexperience in the EU/US diabetes landscape, along with questions surrounding Biocon’s manufacturing facilities, cast some doubt about Semglee’s penetrative capabilities. Finally, we were encouraged by late-breaking news this year that Novartis’ generics/biosimilar arm Sandoz will partner with Chinese Gan & Lee to develop and commercialize biosimilar glargine, lispro, and aspart, citing anticipated increased insulin needs as global diabetes prevalence continues to rise. Novartis, historically, has taken patient access across healthcare very seriously, and we’re looking forward to what this partnership might bring to the insulin market. We would like to know more about how how accessible they are making their DPP-4 inhibitor Galvus – they had promised to make it available to many people in high need for about $1/day and we will be asking more about this at JP Morgan. Despite pricing pressures, commercial success for biosimilar basal insulins is still possible – look no further than Basaglar’s 2018 performance. Lilly/BI’s Basaglar revenue tripled YOY in 1Q18 to sell $332 million, more than doubled YOY in 2Q18 to $404 million, and then grew 38% YOY in 3Q18 to $402 million. In terms of volume, Basaglar now holds a substantial 17% of the US basal insulin market; moreover, in terms of US new-to-brand prescriptions, Basaglar is the second highest ranked product in Lilly’s portfolio. Basaglar’s ability to post hand-in-hand volume and revenue gains is an especially encouraging sign that emerged in 2018, and one that indicates the possibility of future success for additional biosimilar basal insulins entering the market. As the first of such biosimilar basal insulins to market, Basaglar continues to perform the important legwork of cultivating HCP familiarity with the idea of biosimilar insulins. We imagine that Mylan/Biocon’s Semglee will greatly benefit from this smoother runway as it reaches the market, though there may also be new commercial challenges (i) as a greater number of basal insulins are available and (ii) due to the relative lack of experience in the US/EU diabetes markets between Mylan and Biocon. In June, FDA withdrew draft guidance originally published in September 2017 explaining how manufacturers could show similarity between biosimilars and the original products, after public comments raised concerns that the requirements were too burdensome. In July, FDA released an 11-part biosimilar action plan to improve the efficiency of the biosimilar and interchangeable product development and approval process. In December, FDA Commissioner Dr. Scott Gottlieb outlined new actions to advance the agency’s Biosimilar Actions Plan. Starting in March 2020, insulin will be regulated as a biologic, opening up streamlined regulatory processes for biosimilars and easing the acquisition of interchangeability designations. Dr. Gottlieb’s tenure at FDA has been marked by consistent messaging of support for generic and biosimilar market entries. In July this year, he furthered this message by criticizing industry tactics that are supposedly contributing to an “anemic” biosimilar market. We’re curious to see how this continued involvement from FDA will impact the future of biosimilar insulins, and whether this drives even more manufacturers to consider the development of biosimilar insulins – such a consequence would represent a huge win for patients and the healthcare system alike. Landmark results from the first two CVOTs to enroll majority primary prevention populations (risk factors but no established cardiovascular disease) brought issues of CVOT generalizability to a head. Both REWIND (for Lilly’s GLP-1 agonist Trulicity) and DECLARE (for AZ’s SGLT-2 inhibitor Farxiga) enrolled majority (69% and 59%, respectively) primary prevention cohorts – and both achieved superiority on a primary endpoint. While we don’t yet have access to subgroup results from REWIND, we do know that both primary and secondary prevention patients in DECLARE saw a benefit on the composite of hospitalization for heart failure and CV death. What’s more, FDA’s October Advisory Committee on its 2008 CVOT mandate grappled directly with the generalizability (or lack thereof) of these massive trials – if the results only apply to a fraction of patients with diabetes, what value are they truly offering? In a poster at ACC 2018, Dr. Eric Wittbrodt highlighted that ~half of patients with type 2 diabetes in the Diabetes Collaborative Registry (DCR) would not be eligible for any SGLT-2 inhibitor CVOT. Based only on exclusion criteria related to A1c, chronic kidney disease (CKD) status, and CV history, 21% of type 2s would have been eligible for EMPA-REG OUTCOME, 30% for CANVAS, and 46% for DECLARE. When this analysis was extended to all inclusion/exclusion criteria in SGLT-2 CVOTs, only 4% of type 2s in the 2009-2012 NHANES database were eligible for EMPA-REG, 5% for VERTIS-CV, 9% for CANVAS, and 40% for DECLARE. Indeed, meaningful heterogeneity also exists within the ~one-fifth of people with diabetes who have CVD, and we’ve heard further criticism of selection bias within secondary prevention. Most shockingly, 59% of type 2s in the NHANES database were not eligible for any SGLT-2 CVOT, and only 1% were eligible for all – demonstrating not only the underrepresentation of the broad type 2 population in these trials, but also the substantial differences in study populations across trials. As such, prominent thought leaders including Drs. Lawrence Leiter and Robert Ratner have criticized this narrow aspect of CVOT design, arguing that eligibility requirements (which Dr. Ratner deemed “cherry-picking” at the FDA Ad Com) have the potential to skew results, even if they were put in place for good reason – see more below). This all said, we have heard little reason to believe that, if safety is demonstrated in a high-risk population, a drug would not be safe in a lower-risk population (there is question about long-term risk beyond the duration of a typical CVOT). In fact, Dr. Mikhail Kosiborod went so far, at AACE 2018, to assert that GLP-1 agonist mediated cardioprotection should extend to primary prevention – it doesn’t make physiological sense otherwise, though it may take longer to show up statistically. The apparently very different cardioprotective mechanisms of SGLT-2s and GLP-1s raise interesting questions about when in the course of disease they should be utilized. For example, there is growing consensus that GLP-1s exert their CV benefit via anti-atherosclerotic effects, in which case a patient may need to have pre-existing plaques to experience appreciable CV risk reduction in a short period of time. Of course, there’s also the chance that treatment prevents plaques from forming in the first place – but the burden of demonstrating this type of benefit is much higher, as reflected in REWIND’s much longer-than-typical 5.4 year median follow up. Meanwhile, DECLARE found significant heart failure benefit with dapagliflozin in both the primary and secondary prevention cohorts, leading Drs. Subodh Verma and Javed Butler to call for broader, earlier utilization of the class for it CV and renal benefits. It appears increasingly likely that SGLT-2s reduce risk for heart failure (and CKD progression) independent of CV risk or diabetes status – we’ll have a much more definitive answer on this in a couple years, now that AZ and Lilly/BI are investigating their SGLT-2 inhibitors in people with chronic heart failure, with or without diabetes (and we anticipate a subgroup of these studies will have prediabetes, allowing for interesting analyses and better generalizability). No consensus has been reached on how to improve CVOT generalizability, and other approaches (e.g., real-world data) don’t offer an acceptable alternative. It’s important to remember that strict inclusion and exclusion criteria are in place for essential reasons: ensuring safety and internal validity, minimizing withdrawal and costs, establishing causal relationships (e.g., A1c criteria to encourage glycemic equipoise), and buoying chances of reaching primary end-points in a reasonable timeframe, to name a few. As we’ve heard it, simply expanding eligibility criteria to force generalizability could make accumulating the number events needed to prove safety (not to mention benefit) exorbitantly expensive, discouraging innovation. Further, there is little reason to believe that, if safety is demonstrated in a high-risk population, a drug would not be safe in a lower-risk population (as was supported by reassuring safety data from DECLARE) ­– superiority is another story, of course. Yet, abandoning CVOTs altogether in favor of real-world, post-market monitoring also has significant flaws and we can’t imagine the field would move squarely to that. For example, Dr. David Fitchett recently scrutinized the discrepancies between CVD-REAL (SGLT-2s in real world data) and CVOTs for SGLT-2 inhibitors at WCTD 2018, pinpointing serious selection, classification, and confounder biases present in RWD, arguably also precluding internal validity and generalizability. Arching over these discussions is the question of whether CVOTs (in their current state) are warranted at all, given that none have revealed a harmful CV signal to date. Moreover, according to Dr. Ratner, it may no longer be ethical to randomize patients to placebo following the new ADA/EASD consensus report, which recommends a GLP-1 or SGLT-2 be considered for all patients with established CV disease – another key theme to emerge in CVOTs this year. Certainly, whether with respect to the population studied, comparator, endpoints, or any combination of methodologic details, the FDA Advisory Committee made it clear that some aspect of CVOTs should be amended, as virtually no committee member recommended no action be taken. Members advocated strongly for more pragmatic, lower-burden trial design, and we’re looking forward to action from FDA on this front. An eventful year for next-generation glucagon culminated in two regulatory submissions, for Lilly’s nasal glucagon (FDA and EMA) and Xeris’ Glucagon Rescue Pen (FDA). The latter has a PDUFA date of June 10, 2019, and we anticipate a decision on Lilly’s NDA around the same time. We don’t anticipate any big regulatory hurdles, given that both products have demonstrated non-inferiority to current standard-of-care and don’t carry any excess/additional safety issues or concerns. In the case of an Advisory Committee meeting, we would anticipate a significant patient advocacy presence given the massive improvements that both Xeris’ G-Pen and Lilly’s nasal glucagon offer over current glucagon reconstitution kits, which are unwieldy and error-prone, requiring a complex and time-consuming mixing process. For example, in one human factors study, 99% of participants successfully administered a full glucagon dose with the G-Pen compared to only 6%-31% of those using reconstitution kits, reflecting the potential for the G-Pen to offer a real-world benefit on safety. Just behind Xeris and Lilly in the next-generation glucagon competitive landscape is Zealand’s dasiglucagon, for which positive pivotal phase 3 results were released in September (more below). Notably, the final trial standing between dasiglucagon and both FDA and EMA submission is a phase 3 pediatric trial (n=40 children age 6-17 with type 1 diabetes), which began enrolling in October. If all goes according to plan (full completion of that final trial is expected in August 2019), Zealand could submit dasiglucagon to regulators as soon as 4Q19. Excitingly, dasiglucagon is also being investigated for congenital hyperinsulinism (potentially allowing for a rare pediatric disease priority review voucher, six-month FDA review period, and several years of patent exclusivity following NDA submission for a CHI indication) as well as in Beta Bionics’ dual-hormone pump, which would be the first artificial pancreas to market should targeted approval by 2022 be reached – though some would call this timing ambitious. Much remains to be seen in terms of market potential for next-gen glucagon, but we certainly see room for multiple new glucagon products to be commercially successful. Lilly’s Glucagon grossed $47 million in 3Q18 (quarterly sales have ranged from $26-$47 million over the past two years); unfortunately, Novo Nordisk does not break out GlucaGen sales, but we understand that they’re in the same ballpark. Xeris has officially estimated US market potential at $2 billion annually based on current glucagon kit prices and a patient population of 3.5 million, but we consider this number quite ambitious. On the other hand, Zealand estimates a >$700 million market by 2025, a more reasonable estimate that still represents more than doubling from the current base of $350 million/year (a number supplied by Zealand in September, and one that makes sense given the above estimates). To be sure, market penetration could be greatly improved, and new, patient-friendly products should help get glucagon into far more patient hands; our sense is that many patients and families do not widely embrace or consider glucagon as useful or necessary, but a more convenient product could really shift that thinking. As such, innovative glucagon products certainly stand to expand the current market. We would love to see Lilly, Xeris, and Zealand leverage these products in campaigns to both improve glucagon prescribing practice and promote uptake within the diabetes community. Xeris went public in June, bringing in a whopping $89 million ($21 million more than expected!) in net proceeds from its IPO. More than anything, we see this success as representative of the desperate need for better glucagon options and resulting market potential. Pivotal Phase 3 Results: 99% of patients using dasiglucagon experienced a ≥20 mg/dl blood sugar increase within 15 minutes of glucagon administration (median=10). Phase 2 PK/PD Results: Normoglycemia (>70 mg/dl) was restored in a median time of 14, 10, 6, and 6 minutes for respective dasiglucagon doses of 0.03 mg, 0.08 mg, 0.2 mg, and 0.6 mg. Phase 3 PK/PD Results: Xeris’ autoinjector was 97% successful in getting patients to >70 mg/dl or giving a ≥20 mg/dl blood sugar increase within 30 minutes of glucagon administration. Mean time to resolution of autonomic symptoms was 15 minutes with Xeris’ autoinjector vs. 14 minutes with Lilly’s glucagon reconstitution kit (p>0.05); mean time to resolution of neuroglycopenic symptoms was 16 minutes vs. 14 minutes (p>0.05). Human Factors Study: 99% of patients using Xeris’ autoinjector were successful in administering the full glucagon dose. Real-world Phase 3 Results: Lilly’s nasal glucagon was 96% successful in “awakening or returning patients to normal status” following severe hypoglycemia within 30 minutes of glucagon administration. 98% of caregivers were able to deliver nasal glucagon to a patient experiencing hypoglycemia within two minutes. Interspersed discussion around the use of technology to mitigate hypoglycemia increasingly evokes the prospect of mini-dose glucagon. At EASD 2018, Prof. Thomas Danne posited that we are nearing a paradigm shift in hypoglycemia treatment: “I really think five years from now, the approach to hypoglycemia and the use of glucagon will be very different – it won’t only be used in emergency situations, but it could become part of the treatment.” He gave the all-too-common example of patients with low, but not severely low, glucoses who are unable or not wanting to take carbohydrates for a host of reasons, and would perhaps be more inclined to administer mini-dose glucagon; after all, a fully functional pancreas would respond to low blood sugar in a similar way. This could take the form of a mini-dose injection, as in the case of Xeris’ phase 2 study of glucagon for mild-to-moderate hypoglycemia, or automated bihormonal delivery (Beta Bionics is, again, likely closest to market here, though there is academic work at McGill and OHSU, among others). Among patients, we’ve noticed extremely high enthusiasm for the prospect of mini-dose glucagon, and although we also think reimbursement and patient access/cost will be a critical issue here, we imagine lots of aligned patient advocacy around this from many quarters – T1D Exchange, Beyond Type 1, diaTribe, and others, if we had to guess! 2018 was a watershed year for dual agonists, as Lilly’s GLP-1/GIP dual agonist tirzepatide became the first-ever dual agonist to enter phase 3 investigation, following presentation of unprecedented phase 2 data at EASD 2018. The candidate conferred an average 2.4% A1c drop and ~25 pounds of weight loss at 26 weeks at the highest 15 mg dose, offering a truly remarkable degree of efficacy. However, one in four participants in this group discontinued treatment due to adverse events. Indeed, as much as the compelling efficacy of tirzepatide blew us away, its tolerability profile will be a point of serious concern moving forward – in fact, tolerability is emerging as a potential Achilles heel of all candidates in the multi-agonist landscape (more on that below). That said, presenter Dr. Juan Frias underscored that all other doses (1, 5, and 10 mg) had lower discontinuation rates than the active comparator in the trial (Trulicity 1.5 mg), with the 10 mg tirzepatide dose conferring ~80% of the glycemic and weight benefit of the 15 mg dose. Moreover, he noted that participants were escalated to the highest dose rapidly in the trial. To this end, in a later investor call, Lilly Senior Medical Director Dr. Brad Woodward confirmed that the majority of discontinuations with the 15 mg dose occurred during the early titration period, and a smaller 12-week dosing study apparently decreased discontinuation to <5% within any given dose. Proving that the troubling tolerability of tirzepatide (and dual-agonists in general) can be overcome with more careful dosing and titration would be a massive step forward for the class and huge win for patients. We were thrilled to hear that this slower, step-wise titration scheme will inform the eight study phase 3 SURPASS program for tirzepatide (more details on that here), and we’ll keep a close eye on how the titration changes pan out. The first trial in the program (SURPASS 4; tirzepatide vs. insulin glargine in people with established CVD) is already recruiting and set to conclude in mid-2021. SURPASS also includes a comparative study vs. semaglutide and a superiority-powered CVOT, enabling a hopeful 2022 regulatory submission for tirzepatide. Dual agonists represent a potential leap forward in incretin therapy, not only for diabetes but also for obesity and NASH. An astounding 30% of participants on tirzepatide 15 mg achieved an A1c <5.7% and 25% achieved ≥15% weight loss (both statistically significant against placebo and Trulicity) – the room at EASD 2018 came alive when weight loss data was revealed. To this end, we were pleased when Lilly announced plans to start a phase 3 program in obesity and a phase 2 trial in NASH for tirzepatide in 2019. There’s no doubt that more efficacious pharmacotherapies are desperately needed in these areas – especially obesity – and most other dual agonist manufacturers have plans to explore their candidates for obesity or NASH/NAFLD indications, too. In particular, we’re encouraged by clear investment in obesity from Sanofi and J&J, as well as a handful of early-stage NASH studies of incretin therapies. The more robust GLP-1/glucagon dual agonist landscape also heated up in 2018, with new phase 2 data from several candidates but similar concerns over tolerability. Currently, Sanofi’s SAR425899 narrowly leads in the race to phase 3, but the status of a planned phase 3 program in obesity for that molecule is uncertain following concerning (25% dropout) tolerability data in a phase 2b dose-ranging study (n=296) that read out in December 2017, discussed during the company’s 1Q18 update. Since then, initiation of a planned phase 2 NASH study (n=126) has been delayed to May 2019, and the candidate remains in phase 2 for overweight/obesity in type 2 diabetes in Sanofi’s pipeline. This came as somewhat of a disappointment following expressed confidence at JPM 2018 from CEO Mr. Olivier Brandicourt in Sanofi’s “best-in-class molecule,” which demonstrated ~8 lbs of weight loss in only four weeks. Moreover, comments from Global Head of R&D Dr. John Reed in 3Q18 cast further doubt on the near-term future for the molecule as the company explores options for up-titration schemes, though we understand that Sanofi remains very committed to the candidate overall. Close behind SAR425899 is AZ/MedImmune’s MEDI0382, for which promising reductions in hepatic fat content in type 2 diabetes (indicating potential in NAFLD/NASH) and exciting phase 2a data in diabetes were presented at ADA and EASD, respectively. Very notably, the latter demonstrated ~7.4 lbs of weight loss, a 22% drop in glucose AUC, ~0.7% A1c reduction, and +25% time-in-range in seven weeks. Unfortunately, less inspiring tolerability data were not improved in an arm with more gradual titration of MEDI0382. To this end, the candidate is being investigated in a phase 2b dose ranging study before the company decides whether to carry it into phase 3. Elsewhere in the GLP-1/glucagon landscape, J&J launched two phase 2 trials in obesity with and without type 2 diabetes for JNJ-64565111 in July and April, respectively, both of which are expected to complete by March 2019. Also, enrollment for OPKO Health’s phase 2b dosing study (n=110) of OPK88003 was completed in 2Q18, including a 30-week treatment period, testing eight weeks of dose escalation followed by a 22-week maintenance phase, and is expected to complete in June 2019. Doubtless, the common theme among these candidates and manufacturers is that all are proceeding very deliberately with their dual agonist development, ostensibly attempting to prove that concerning tolerability issues can be mitigated (likely through more gradual dosing) prior to phase 3. On a broader level, we were thrilled to see CGM incorporated into MedImmune’s phase 2a trial. As therapies become more advanced, we expect and hope to see greater utilization of CGM to demonstrate the full benefit of new candidates. The company has assessed as overwhelmingly positive on account of the fine-detail glucose effects revealed in analysis. For example, Dr. Victoria Parker explained that the glycemic benefits and reduced variability offered by MEDI0382 seem to begin within hours of the first dose, as demonstrated by decreased mean glucose levels immediately following the first administration of the dual agonist in CGM tracings – a sentiment which was echoed at MedImmune’s Translational Science Forum immediately following EASD. Looking farther off on the horizon, we’re beginning to hear increased enthusiasm for tri-agonists. And for good reason: Dr. Matthias Tschöp predicted even greater potential for tri-agonists should preclinical efficacy translate as well to clinical trials as it has for dual-agonists. That said, we think it’s important to temper expectations, as two of the three GLP-1/glucagon/GIP tri-agonists currently in development (Sanofi and Zealand – both announced in 1Q18) are preclinical while the furthest along (Novo Nordisk) is currently recruiting for its second phase 1 study, expected to complete in September 2018. 2018 was an remarkably steadfast if somewhat underwhelming year for fixed-ratio GLP-1/basal insulin combination therapies (Novo Nordisk’s Xultophy and Sanofi’s Soliqua). At a glance, when one product’s growth slowed down for a quarter, the other picked up; pooled revenue has followed a nearly straight line for almost two years (since both products were simultaneously approved in December 2016 and launched in 1Q17). 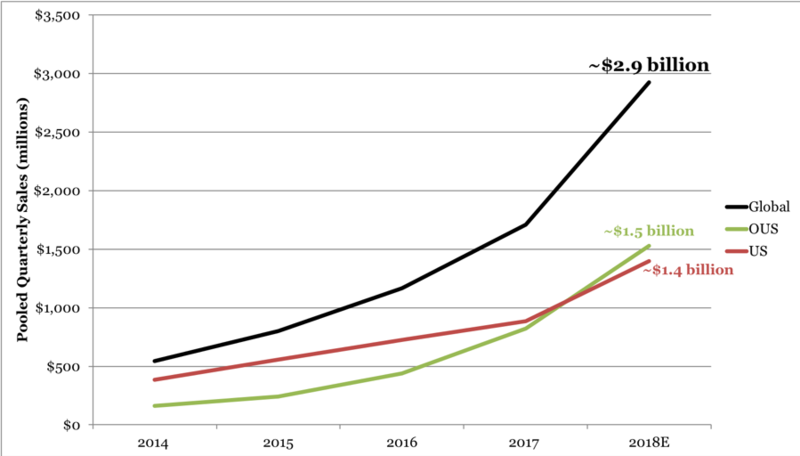 By value share, the class remained nearly exactly at 75% Xultophy/25% Soliqua throughout 2018, despite Soliqua capturing ~two-thirds of prescriptions with “significantly more coverage” than Xultophy (according to Zealand’s 2Q18 update) – indicating a much better realized price for Xultophy. Despite consistent growth, we continued to lament low uptake for this remarkable therapy class; while the combos grew at a steady rate all year, we feel strongly that they should be growing much, much faster. Indeed, our sense is that most have been either underwhelmed by the launch of this highly-anticipated class (Dr. John Buse has gone so far as to call Xultophy “the most effective anti-hyperglycemic agent on the planet”) or that it’s considered too much of a “hassle” to use (since many want to start with monotherapy), though we maintain it is much too early to draw definitive conclusions, particularly given Novo Nordisk is only beginning to seriously invest in making Xultophy a success. We do know it’s been hugely successful in certain geographies like France. Since the class’ inception, we’ve enumerated its most significant benefits and barriers (see table below), and the lack of any substantial changes throughout 2018 coupled with incredibly steady growth reflects the “fixed” (pun intended) state of this class. From where we stand, it seems unlikely that the class will realize its full potential until (i) US labels allow direct initiation of these combination, prior to GLP-1 or basal therapy, (ii) the products gain an established place in treatment algorithms, and/or (ii) reimbursement and affordability improves. To be sure, these barriers overlap, and overcoming any single one should lead to decreased resistance on another. We are glad to note incorporation of FRCs into the new ADA/EASD Consensus Report, where the injectable algorithm recommends considering one of these agents when adding basal insulin to the recommended first-injectable GLP-1. That said, the Report also emphasizes the high cost of these products and the fact that weight loss is lower than with a GLP-1 agonist alone, as well as the upper limit on basal dose with the fixed-ratio combination. Glucose-lowering: Non-inferior A1c reduction of 1.5% with Xultophy compared to basal-bolus therapy with Lantus and NovoLog. Milder side-effect profiles: 89% reduction in severe or blood-glucose confirmed hypoglycemic episodes compared to basal bolus therapy; weight loss or weight neutrality; less GI discomfort. Greater patient convenience/lower injection burden: One injection per day vs. 2-5 with basal-bolus therapy, no added bolus adjustments, fewer units of insulin. US label requirements: Both Soliqua and Xultophy US labels currently require patients to already be on basal insulin or the specific GLP-1 included in the combo before starting the fixed-ratio injection. Encouragingly, at ADA 2018, Tulane’s Dr. Vivian Fonseca advocated that FDA change product labels to elevate fixed-ratio combinations to a first injectable therapy in diabetes care. Reimbursement: ADA-EASD Consensus notes very high cost of class. No established place in everyday clinical practice: Newcastle’s Professor Philip Home has previously relayed to our team that some prescribers continue to view GLP-1 agonists as a “pre-insulin” therapy, making fixed dose combinations of the two seem illogical. Evolving manufacturer opinions on fixed-ratio basal/GLP-1 combinations have made it difficult to pinpoint their perceived potential by industry. In their respective 3Q18 calls, Novo Nordisk relayed its optimism and focus on Xultophy while Sanofi was entirely silent on Soliqua. This was slightly surprising (and disappointing) to us, though it is true that Sanofi focuses on a broader set of therapeutic areas than Novo Nordisk. Historically, Sanofi has invested quite a bit more than Novo Nordisk in promoting fixed-ratio combination therapy and in securing access for Soliqua (see the value/volume breakdown above); in contrast, Novo Nordisk has previously de-prioritized Xultophy to focus on building up the Tresiba and Victoza franchises individually – though our sense has been that this has started to change for the latter. In its 3Q18 call, Novo Nordisk’s management labelled Xultophy a key innovative product for the company and asserted their focus on capturing an even greater market share in the future. We know that Xultophy is doing very well in European markets where it has gained access, most notably in France (interestingly, where Tresiba isn’t covered). By comparison, Sanofi did not mention Soliqua once during prepared remarks or Q&A, and it did not break down sales by geography for the first time since 3Q17. We certainly hope that Sanofi does not view barriers to uptake as insurmountable, as the combos have SO much to offer patients. Patient-reported outcomes demonstrating the impressive convenience, efficacy, and safety offered by basal/GLP-1 combos offers a compelling argument for greater uptake. A new DUAL VII analysis presented at EASD 2018 offered highly compelling evidence in favor of the patient experience benefits of Novo Nordisk’s Xultophy (insulin degludec/liraglutide) over basal-bolus regimens. According to Dr. Eden Miller, Xultophy treatment was less burdensome to patients than basal-bolus therapy in terms of dose adjustments, injection burden, and total daily insulin dose. While basal insulin adjustments were similar between the two groups (~17), the number of bolus insulin adjustments (inherently only in the basal-bolus group) averaged around 200 over the course of the 26-week trial. Moreover, the number of injections per day is always only one with Xultophy, compared to two to five for the basal-bolus group (an SMBG test was also required for each injection, adding extra burden to the basal-bolus group). Finally, total daily insulin dose at 26 weeks clocked in at a mean of ~40 units for the Xultophy group, compared to an average of ~84 units for the basal-bolus group (p<0.0001); basal dose alone was also higher in the basal-bolus group. As a reminder, Xultophy demonstrated non-inferiority to basal-bolus on A1c lowering in DUAL VII, but also offered superiority on secondary outcomes including severe or symptomatic hypoglycemia (89% reduction) and weight change (-2.1 lbs with Xultophy vs. +5.8 lbs with basal/bolus). Of course, it’s important to note that no direct measure of patient satisfaction or quality of life was gathered, and we cannot assume that convenience necessarily translates to satisfaction for all patients. That said, we often hear thought leaders decry the complexity – and often, corresponding lack of efficacy – associated with basal-bolus regimens, and more needs to be done to make sure patients have information about and access to treatments, like Xultophy, that could help make their diabetes management easier. Two major players in diabetes, JDRF and Novo Nordisk, made significant investments in glucose-responsive insulin (GRI) in 2018, bringing renewed energy to what many think will be the next major development in insulin therapy. In June, JDRF announced a one-year partnership with Gubra to develop a new glucose-responsive insulin. Gubra’s GRI candidate uses a novel mechanism in which a glucose-sensitive linker is introduced at the lipidation site of human insulin, thus allowing for the combination of both basal and prandial insulin properties. JDRF and Gubra noted that the goal of the one-year partnership is to move the candidate’s chemistry toward in vivo proof-of-concept clamp studies in model organisms by refining the glucose-sensitivity range of the molecule, with the expectation to reach IND/clinical stages in two-three years – meaning this project is still quite early stage. Two months later in August, Novo Nordisk announced its acquisition of Ziylo, a University of Bristol spin-off devoted to developing synthetic glucose-binding molecules for therapeutic and diagnostic applications. Novo Nordisk is planning to pair the suite of Ziylo’s glucose-binding molecules with its diverse insulin platform in its quest to develop a viable GRI. We were pleased to see these investments in GRI occur in 2018, and we also recognize the immense impact that GRIs could have on quality of life for all people with diabetes on insulin. Many thought leaders consider GRIs as the next great development in insulin technology, and some patients and providers even feel that a GRI would even be a functional and non-invasive “cure” for diabetes. In the best case, a GRI eliminates the risk of hypoglycemia while effectively and quickly reducing hyperglycemia, also allowing for only one injection per day (or even per week, though a daily insulin would likely come first). As such, a successful GRI would lower treatment burden for patients, reduce hypoglycemia risk, and even decrease long-term complication risks through better postprandial and overall glucose control. To our understanding, any GRI is more than a decade away from reaching patients (in the best case), but 2018 definitely gave the field renewed hope in striving for this admirable, albeit lofty, goal. To be sure, development of an effective GRI comes with wide-ranging technical challenges that are currently unsolved. Perhaps most importantly, a molecule must be programmed sensitively toward a narrow and physiologically appropriate glucose range, which is no small feat, but cost and insulin receptor kinetics are also key. Merck is the only company, to our knowledge, to have ever advanced a GRI into clinical development: MK-2640 was discontinued following insufficient efficacy in phase 1 (see a publication on that molecule here – kudos to Merck for publishing this), and the company has moved another candidate into phase 1 since then. According to Dr. J Hans Devries at IDF 2017, phase 1 data on this second MK molecule were due in 2018, but we’ve yet to hear anything (preclinical data were presented at ADA 2017). A quick look at the GRI competitive landscape reveals little success to date but ever-increasing investment from a variety of academic and industry players, reflecting the high potential payoff but scientific challenge that GRI presents. Encouragingly, both Novo Nordisk and Lilly made substantial investments in type 1 cures in 2018. In April 2018, Lilly announced a new partnership with MIT spin-out Sigilon Therapeutics to collaborate on developing a beta cell encapsulation therapy for type 1 diabetes. Lilly paid $63 million upfront – in addition to undisclosed equity investment in Sigilon – to license Sigilon’s proprietary Afibromer technology, a “superbiocompatible” material that protects implanted devices or cells from foreign body response. Lilly’s significant investment in the Afibromer technology signals confidence in beta cell encapsulation technology; seeing as this area of R&D had been previously dominated by small biotechs, the entry of a diabetes giant like Lilly is very encouraging for the entire field. A month after Lilly’s move, Novo Nordisk in May 2018 strengthened its commitment to stem cell therapies for type 1 diabetes, forming a strategic collaboration with UCSF and Cornell and also stating a goal to advance encapsulated beta cells into clinical trials “within the next few years.” From UCSF, Novo Nordisk licensed technology to generate human embryonic stem cell lines; with Cornell, the company teamed up to make progress on developing an encapsulation device to house those stem cell derived beta cells and protect them from foreign body response. As a whole, investment from both Novo Nordisk and Lilly could majorly shake up and push forward the competitive landscape for type 1 cures, and it also represents an important vote of confidence for the clinical plausibility of beta cell encapsulation technologies. ViaCyte broadened its investment in beta cell replacement with new partnerships. Capping off an eventful 2H18 that saw a $10 million investment from W.L. Gore plus $15 million from CRISPR Therapeutics, ViaCyte announced in late November 2018 the securement of an $80 million Series D financing led by Bain Capital Life Sciences (notably, the first investment by the group in diabetes). In total, ViaCyte raised $105 million in 2H18 to advances its pipeline of stem cell-based beta cell replacement therapies for insulin-requiring diabetes (both type 1 and type 2). However, ViaCyte announced its newest effort at JPM 2018 at the very start of the year: PEC-QT is meant to serve as a final beta cell replacement solution, through a partnership with CRISPR Therapeutics to develop an immune-evasive stem cell line and universally appealing beta cell replacement therapy. This project aims to enable the development of a directly vascularized product (like PEC-Direct) but without the need for chronic immunosuppression, because the cells cannot be detected and destroyed by the immune system – an exciting proposition, to be sure. Nevertheless, while the allure of a functional “cure” for type 1 diabetes is strong, we feel it’s essential to temper enthusiasm and expectations. At this time, ViaCyte’s phase 1/2 PEC-Encap and PEC-Direct and Sernova’s phase 1/2 Cell Pouch System are the only candidates in the beta cell encapsulation competitive landscape to reach clinical development. We await compelling safety and efficacy data for ViaCyte’s two clinical stage candidates; data on PEC-Direct, the most advanced candidate, is anticipated in mid-2019. Given the numerous hurdles companies in this arena have or will have to face, we would be pleasantly surprised to see beta cell replacement reach the market in the next decade. It was a mixed bag for other disease-modifying and type 1 prevention therapies in 2018. In a relative bright spot, a JDRF-funded research group reported in July 2018 positive results from a phase 2 study showing that the widely-used blood pressure medication verapamil promotes insulin production in adults with recent-onset type 1 diabetes. To be sure, the study was quite small (n=32), but provided encouraging, hypothesis-generating evidence that verapamil can promote and preserve beta cell function in this specific patient population. Seeing as verapamil is a well-established and affordable drug for blood pressure-lowering already (it’s even on the WHO’s List of Essential Medicines), we are thrilled about the possible applications for extending beta cell function in adults with recent-onset type 1 diabetes. Less encouragingly, ADA 2018 was abound with middling results on the type 1 cure/prevention front. TrialNet data offered some evidence of benefit with low-dose antithymocyte globulin (ATG) therapy on C-peptide levels in people with disease duration of <100 days, but data from Kamada’s phase 2 trial of serine protease inhibitor AAT and the TEDDY study were both underwhelming. Nevertheless, the competitive landscape for type 1 diabetes prevention/cures remains robust, and we’ve heard significant optimism surrounding the potential for combination therapy (e.g., anti-inflammation + immunosuppression) to make a big jump forward. To be sure, there is substantial hope for the future; on this note, we highly recommend viewing JDRF’s video review of its 2018 Top Advances. We’re still learning about the NASH/NAFLD arena and we’ll be back with more developed opinions as time marches on and we learn more. Undoubtedly, the treatment need for this burgeoning disease is increasing, yet overall it’s our sense that HCPs today are in some ways “shooting from their hips” (Dr. Robert Eckel at Keystone 2018 ) in trying to treat NAFLD/NASH without approved therapies (AASLD guidelines). Lots is moving on the regulatory front and although the barriers haven’t necessarily changed meaningfully, it’s notable that four candidates have entered active phase 3 development (see the NAFLD/NASH competitive landscape): Gilead’s selonsertib (ASK1 inhibitor), Genfit’s elafibranor (PPAR alpha/gamma agonist), Intercept’s obeticholic acid (FXR agonist), and Allergan’s cenicriviroc (CCR2/5 inhibitor). Potentially data for all four of these compounds will be available in 2019 (Gilead’s and Intercept’s trials are scheduled to complete in the first half of the year; Allergan’s and Genfit’s in the fourth quarter). The prospect for an approval submission in late 2019 or early 2020 is thus high. There are other drug classes in phase 2 NASH trials, including drugs currently approved for the treatment of diabetes. Novo Nordisk and Sanofi both have GLP-1 drugs in phase 2 (with data possibly available at year end 2019 or in early 2020). Novartis is also conducting a phase 2 clinical trial for an SGLT-1/SGLT-2 dual inhibitor which may be complete by the fourth quarter of 2019. Nascent excitement for GLP-1’s potential in NASH. At Obesity Week 2018, GLP-1 aficionado Dr. Dan Drucker predicted that GLP-1s will ultimately prove to be an effective therapy for NASH, pointing to data from the phase 2 LEAN study demonstrating positive changes in liver histology with liraglutide treatment. While it appears as if Novo Nordisk is no longer investigating liraglutide in NASH, it is currently studying semaglutide in a phase 2 NASH study, which is expected to complete in 2020. Referring to semaglutide as “our current favorite molecule,” Novo Nordisk’s Senior Director of NASH, CKD & Obesity Search & Evaluation Dr. Matthew Coghlan also highlighted the medication’s potential in NASH at WCPD 2018, referencing a phase 2b dose-finding trial of injectable semaglutide, expected to wrap up in 2020. He also expressed mechanistic enthusiasm for the utility of GLP-1 in NASH at NASH Summit 2018, highlighting the therapy’s effects on weight, inflammation, glucose metabolism, insulin resistance, and lipids. As Dr. Eckel outlined at Keystone 2018, the three main contributing factors to NAFLD/NASH pathogenesis are lipotoxicity, fibrogenesis, and inflammation. He presented a meta-analysis showing positive effects of GLP-1s in terms of reducing steatosis and lobular inflammation – in line with Dr. Coghlan’s enthusiasm. We certainly agree that, from a pathogenesis standpoint, GLP-1 use in NASH seems to make perfect sense. In addition to the GLP-1s mentioned above, the NAFLD/NASH competitive landscape is brimming with GLP-1-based therapies, including Lilly (phase 1), J&J/Hanmi (undisclosed), and Lynkogen/Alteogen (undisclosed). While not included in our Landscape, MedImmune/AZ’s promising GLP-1/glucagon dual agonist MEDI0382 reduced hepatic fat content in type 2 diabetes in a presentation at ADA 2018, and we wonder about the potential for Lilly’s GLP-1/GIP dual-agonist, tirzepatide, in NASH given its unprecedented weight loss (~25 lbs in 26 weeks). Dr. Eckel’s suggests that weight loss, above all, is directly associated with higher proportions of NAFLD resolution and NASH regression in patients. To this end, Lilly announced in its 2019 financial guidance call that tirzepatide will be investigated in a phase 2 study of NASH – wow! As suggested by the range of drug classes under late stage clinical investigation, 2019 and early 2020 data are more than evaluations of specific drugs. The biology of NASH is still poorly understood, hence the plethora of approaches under development. Doubtless, given the multi-target approach that will likely be required to address all factors contributing to NAFLD/NASH pathogenesis, we are certainly keen on the use of combination therapies to maximize effectiveness of NASH treatment. Notably, FDA released a first-ever draft guidance on the clinical development of NASH drugs. Each of the phase 3 trials has a long duration (ranging from 48 to 78 weeks), with even longer follow-up in most cases. The trials are also complicated, inhibiting direct comparability of results. And they are cumbersome due to required liver biopsies at the start and end of each trial. Emblematic of the uptick in NASH innovation and investment, FDA released its first draft guidance on the clinical development of NASH drugs. Importantly, the [six] phase 3 trials currently underway for NASH therapies are essentially in agreement with the guidance and their progression should not be affected. The only inconsistencies with the draft guidance appear in patient enrollment (FDA advises on enrolling patients at stage 2 or 3 fibrosis, whereas Intercept’s REGNERATE enrolls some with stage 1). Gilead’s REVERSE and STELLAR enroll exclusively patients with stage 4 fibrosis (cirrhosis due to NASH), but we understand that the guidance was not intended for studies in the cirrhosis population. Otherwise, the endpoints currently used in these six trials align with FDA’s guidance suggesting: (i) resolution of steatohepatitis and no worsening of liver fibrosis on the NASH Clinical Research Network (CRN) fibrosis score; (ii) Improvement in liver fibrosis greater than or equal to one stage on the NASH CRN fibrosis score and no worsening of steatohepatitis; or (iii) a combination of these two (resolution of steatohepatitis and improvement in fibrosis. On phase 2 trials, FDA advises study duration of at least 12-18 months. While non-invasive imaging and biomarkers are acceptable for early-stage studies, late-stage phase 2 trials to support phase 3 initiation should include histology (liver biopsy). Notably, FDA states that innovative trials designs could potentially be used that combine phase 2 and phase 3 trials. HCP Education. Even if accelerated marketing was approved under Subpart H, serious challenges remain in commercializing NASH drugs – namely disease understanding (lack of validated diagnostic methods beyond invasive and expensive liver biopsies), economics (pricing and reimbursement are enormous uncertainties), and clinical care paradigms (lack of awareness). To this end, the NASH Education Program was launched in the US in late March 2018 with the specific purpose of raising awareness and improving medical education surrounding NASH. Doubtless, the condition too-often goes unrecognized and undiagnosed despite a staggering 12% prevalence among US adults; for context, diabetes prevalence in the same population is ~9%. Partnerships: there were a number of NASH/NAFLD partnerships announced this year – lots more activity in the arena than we may have expected a year ago! Of the many partnerships at all stages of NASH drug development, perhaps the two most emblematic in 2018 were the Pfizer/Novartis clinical partnership and the Regeneron/Alnylam research partnership. Pfizer and Novartis will continue to develop their internal pipelines independently, and partner with others independently, but have agreed to explore development of their respective NASH drugs in combination. Regeneron had a compelling NASH discovery published in the NEJM, and will work with Alnylam (and possibly others) to develop chemistry for their novel target. Roche subsidiary Genentech acquired Jecure, a company focused on NASH and liver fibrosis, for an undisclosed amount. This marks Roche’s first venture into the increasingly robust NAFLD/NASH competitive landscape. Genentech plans to develop and advance Jecure’s preclinical NLRP3 inhibitor portfolio. This is a partnership aimed at developing combination pharmacotherapies for NASH. Most notably, this collaboration will include a trial evaluating the combination of Novartis’ tropifexor (LJN452, an FXR agonist) and one or more of Pfizer’s three NASH candidates: ACC inhibitor PF-05221304, DGAT2 inhibitor PF-06835919, and KHK inhibitor PF-06835919. This is an alliance to discover and develop an early-stage pipeline of small molecule therapies for the treatment of diabetes, obesity, NASH, CV disease, and DKD. Per the company announcement, Evotec will first leverage its drug discovery platform especially in ligand-based design to build a preclinical pipeline of small molecules. Novo Nordisk will then use Evotec’s INDiGO platform to accelerate preclinical studies and investigational new drug (IND) application submission for suitable candidates. Notably, Novo Nordisk and Kallyope also entered into a collaboration to discover peptides targeting the gut-brain axis for diabetes and obesity. While NASH was not directly referenced in the announcement, NASH has also been linked to dysfunction in gut-brain axis signaling, creating the potential for any drugs developed from this partnership to be investigated across multiple indications. This is a partnership focused on the development and commercialization of GLP-1/A1AT (alpha-1 antitrypsin) fusion therapies for NASH and other metabolic diseases. This partnership brings together Lynkogen’s preclinical focus on metabolic disease and Alteogen’s NexP fusion technology, which allows the fusion of drugs to A1AT. This partnership announced AZ licensing phase-1-ready candidate IONIS-AZ6-2.5-LRx for $30 million; the candidate has not yet been moved into clinical trials, to our knowledge. Ionis has not disclosed the therapeutic target of the out-licensed candidate but shared that it is an inhibitor. AZ will be entirely responsible for clinical development and commercialization (should the drug reach the market). Ionis is eligible to receive an additional $300 million in development and regulatory milestones, plus tiered royalties. This late spring 2018 deal pairs a high-potential dynamic duo – Regeneron identified a variant in the HSD17B13 gene that corresponds to 30% lower risk for chronic liver diseases, while Alnylam is focused on using RNAi to alter the expression of this gene to reduce risk of NASH. The companies will co-develop and co-commercialize any clinical-stage candidate that emerges from this early scientific work, each contributing 50% of the necessary funds. The boundaries between endocrinology and cardiology further eroded in 2018, as we noticed increased collaboration between the two fields, including via new partnerships and guidelines. Representative of this phenomenon was the enhanced focus on managing cardiovascular disease in patients with diabetes evident in all guidelines released in 2018. The ADA-EASD Consensus Report formally and explicitly recommends prescribing SGLT-2 inhibitors and GLP-1 agonists for patients with ASCVD, including heart failure and CKD, for the first time – the strongest-ever recommendations for such in diabetes care. Moreover, the ACC for the first time published a consensus statement on novel therapies for CV risk reduction in type 2 diabetes, echoing the recommendations found in the ADA/EASD consensus guidelines with an endorsement from ADA. Most encouragingly, the ACC strongly urged cardiologists to more actively screen for type 2 diabetes in their patients with or at high risk of CVD, more aggressively treat CV risk factors, and better incorporate data for newer antihyperglycemic agents into routine practice, and these guidelines are an impressive step forward for interprofessional collaboration. This action from the ACC followed the official launch of the AHA/ADA’s multi-year partnership, “Know Diabetes by Heart” which aims to raise awareness about and ultimately reduce the impact of heart failure, CV death, heart attack, and stroke in patients with diabetes. We salute these efforts and note that more initiatives like these will be needed to fully unleash the potential of cardioprotective diabetes drugs. On this note, at AHA 2018, cardiologist Dr. Mikhail Kosiborod lamented the underuse of SGLT-2s and GLP-1s in the patient population where their use is indicated for CV risk reduction, and he advocated for his profession to take greater initiative in managing CVD in patients with diabetes. To be certain, many barriers still exist that prevent cardiologists from utilizing cardioprotective diabetes drugs, such as a fear of hypoglycemia, unfamiliarity with diabetes reimbursement, fear of stepping on endocrinologist/PCP toes, and patient education specifics. Still, we hope to see these barriers continue to dissolve in the coming years as cardiologists become more familiar with and comfortable prescribing GLP-1s and SGLT-2s. Indeed, thought leaders have been calling on cardiologists to be more involved in diabetes care for years, and we imagine that as the decoupling of glycemic and CV benefits for both SGLT-2s and GLP-1s become better understood, the field will be more eager to utilize these remarkable tools. Furthermore, we’re excited to see manufacturers design real-world, pragmatic studies, such as Lilly/BIs COORDINATE-Diabetes study and Novo Nordisk’s SEPRA, which could serve important purposes to this end. The former aims to better understand the effectiveness of coordinating care between cardiologists and endocrinologists in promoting adherence to evidence-based guidelines and stands to demonstrate the benefits of integrating cardiologists into diabetes care – we’re eager to see the positive effect this may have on patient care. HARMONY demonstrated an impressive 22% risk reduction on three-point MACE with albiglutide, strongly supporting a cardioprotective class effect for GLP-1 agonists. GSK has taken Tanzeum fully off the market, but, in the words of Dr. Julio Rosenstock, “The phoenix has risen from the ashes.” Not only did we not expect this, we also are still ruminating about what the implications exactly are about the fact that GSK walked away from this. Following positive MACE results from EMPA-REG OUTCOME and CANVAS, the DECLARE CVOT did not demonstrate a significant risk reduction with dapagliflozin on this endpoint. Whether this has more to do with the much larger (59%) primary prevention population or the dual-primary endpoint design is hard to say, though we did hear commentary before topline results were out that this result should be expected given the lower baseline risk of the trial’s enrollment. We believe most of the field sees GLP-1 as a class that is cardio-protective at this point but this trial certainly shows what a big difference the trial design has on longer-term assessments of the compound – for better or worse. The CREDENCE renal outcomes trial was stopped a year early for demonstrating benefit with canagliflozin ahead of schedule. Previous CVOTs had given indication of positive renal effects with SGLT-2s, but ending an outcomes trial so early is quite remarkable – we eagerly anticipate topline results in early 2019. While Invokana did officially receive its CV indication from FDA in October 2018, unfortunately, there seems to be little effort being dedicated to spreading the word. As we understand it, despite the exciting data, many executives in the Invokana commercial and medical affairs division have moved on. While J&J has not invested in diabetes in a big way in many years, it was very surprising to see such a reduced investment in 2018. Amarin’s Vascepa, a prescription-grade EPA therapy, gave a 25% risk reduction on its primary CV endpoint in the REDUCE-IT trial. In the study, ~58% of participants had type 2 diabetes, and benefits were similar across diabetes and non-diabetes subgroups. This was spectacular to see and we look very forward to see the positioning of the compound in 2019 and beyond. FDA approved the addition of CV and hypoglycemia data from DEVOTE to the label for next-gen basal Tresiba. This was the first time FDA has ever granted a comparative claim on an endpoint – and hypoglycemia, at that – reflecting the compelling benefits of Tresiba over Lantus. That said, SWITCH data was not shown and so there is nothing at the moment for those with type 1 on this front even though the patient views about the next-gen basal insulins (Tresiba and Toujeo) are so strong. Novo Nordisk laid off at least 400 R&D employees in a largescale shift in drug discovery strategy. The company will invest in machine learning and AI to accelerate candidate identification and development. FDA held, in October, an Advisory Committee meeting to discuss its 2008 draft guidance and ongoing CVOT requirements. While it remains unclear what action the agency is considering in the wake of the meeting, the panel did advocate for meaningful change – namely, more flexible guidelines for demonstrating the CV safety of new diabetes drugs. This meeting came without a lot of preparation time and we hope that FDA confers with major professional diabetes groups before announcing draft guidance. Major diabetes players double down on beta cell encapsulation: Joining the April 2018 collaboration between Lilly + Sigilon, Novo Nordisk partnered with UCSF and Cornell in an exciting May 2018 addition to the beta cell encapsulation landscape. Mylan and Biocon received a CRL from FDA for biosimilar insulin glargine (Semglee). According to Biocon, the CRL was triggered by the transfer of glargine manufacturing to a larger Malaysia facility and was anticipated by the companies, but we remain surprised that the companies expected a CRL and hadn't informed investors ahead of time. Intarcia did not resubmit implantable exenatide mini-pump ITCA 650 to FDA this year, as we had anticipated – we now expect this in mid-2019. Just days before the end of 2018, MannKind announced a $40 million public offering, in a move that was said to “exhaust” its available shares. We had not expected that this would be quite so deflating from a stock perspective but we are very happy there is now more investment opportunity for the company in terms of education. We continue to gain more confidence about the compound as we learn more about the patients in whom it is most successful. Will FDA consider granting Ozempic a CV indication based on the combination of SUSTAIN 6 and PIONEER 6 data? While the former met superiority on three-point MACE, the latter did not – but Novo Nordisk has expressed hope that FDA will be open to an indication for Ozempic nonetheless. …And what will the planned, superiority-powered CVOT of oral semaglutide (“SOUL 2”) look like? What proportion primary prevention patients might the study enroll? Will there be other innovative aspect of the study’s design, or a move toward standardization? Will REWIND results for Lilly’s Trulicity support a primary prevention indication? We know the CVOT met superiority on three-point MACE, but will the effects be similar across the enrolled primary prevention (69%) and secondary prevention (31%) populations? With positive HARMONY CVOT results in place, will GSK sell Tanzeum (albiglutide) to a new manufacturer? We would love to see this become a more affordable GLP-1 option. With the launch of Ozempic and announcement of REWIND results, how will GLP-1 agonist market dynamics and shares change throughout 2019? What degree of growth will the class achieve in light of these tailwinds? Will Intarcia re-submit its NDA for ITCA 650 (exenatide mini-pump)? The candidate received a CRL in September 2017, in response to a 1.3 million page NDA submitted in November 2016, and Intarcia continues to re-affirm its plan to re-file for approval. Will the CAROLNA CVOT, comparing DPP-4 inhibitor Tradjenta to SU glimepiride, demonstrate that SUs present long-term safety risks to patients? What will phase 2b (n=834) data on AZ’s GLP-1/glucagon dual agonist look like? The first readout from this dose-ranging study is anticipated in 1H19. As early as January 17 (with the Advisory Committee for sotagliflozin), we’ll get an indication of whether FDA might approve SGLT inhibitors for type 1 diabetes this year. How will FDA and EMA weigh the benefits (A1c lowering, weight loss, time-in-range gains, reduced insulin dose) vs. the risks (DKA) of SGLTs in type 1? Will Lilly/BI submit Jardiance for type 1 diabetes to FDA and EMA in 2019, and when? Are the companies biding their time to see how FDA reacts to submissions from Sanofi/Lexicon and AZ? Can Invokana’s new FDA-approved CV indication help buoy a struggling commercial franchise? J&J now owns the only SGLT-2 inhibitor with an indication for reducing risk of three-point MACE – but will it be enough to overcome lingering concern over amputations? What indication will AZ seek for Farxiga, following DECLARE readout? The effects on the HHF/CV death primary composite were consistent from primary to secondary prevention. Could FDA approve an indication, for example, for preventing heart failure in primary prevention patients? Will Merck/Pfizer more highly prioritize SGLT-2 inhibitor Steglatro in 2019? Both companies have been near-silent on the new SGLT-2 franchise so far, perhaps given a lack of payer coverage for 2018. Will either company finally report Steglatro earnings in 2019? Apparently hindered by ongoing safety concerns, the SGLT-2 class has seen slowed growth in recent quarters; will this change? There were signs of a turnaround in 3Q18, as cited by Lilly, but growth vs. GLP-1 agonists remains relatively low. Will we see any progress on uptake of or manufacturer focus on SGLT-2/DPP-4 inhibitor combinations in 2019? Three of these are already on the market, including Lilly/BI’s Glyxambi, Merck/Pfizer’s Steglujan, and AZ’s Qtern, but we’ve rarely seen revenue reported and understand that cost keeps them out of most patient hands. Did Lilly’s phase 3 ultra-rapid acting lispro (URLi) demonstrate superiority on A1c-lowering vs. Humalog? We know the next-gen prandial was superior on 1- and 2-hour PPG, but Lilly has been quiet on A1c so far. Will any glucose-responsive insulins make it into clinical development in 2019? Can Afrezza gain commercial traction in 2019? FDA removed REMS on the product in April 2018, following an ultra-fast label update in 2017 – but the product has still struggled to break through commercially, despite strong clinical and patient enthusiasm. Will uptake of PCSK9 inhibitors improve with recent pricing changes? Will a CV indication for Praluent further convince payers of the value of this class? What progress can we expect on patient-reported and psychosocial outcomes? We would love to see greater incorporation of patient-centered and mental health measures into clinical trials. How will launches of next-gen glucagon candidates progress? We anticipate approval of both Xeris’ G-Pen (glucagon autoinjector) and Lilly’s nasal glucagon in 2Q19 ­– how will patients with diabetes respond to these new offerings? Will Sanofi be able to return its diabetes franchise to growth? Can Toujeo, Soliqua, and Admelog growth balance Lantus’ loss of exclusivity? Will FDA do anything about its October Advisory Committee meeting on the 2008 draft guidance and CVOT requirements? The meeting saw near unanimity on lowering the barriers to demonstrating CV safety for new diabetes drugs; how will FDA respond? The list below covers expected 2019 milestones for phase 3 and approved products. We acknowledge that this list may not be 100% complete, though we’ve tried to be as comprehensive as possible based on the most recent public updates. If you notice anything missing, please write us. Mylan/Biocon’s Semglee (biosimilar insulin glargine): Following receipt of a June CRL from FDA in response to the companies’ Semglee NDA, Biocon has reinforced that it remains on track for a 2020 launch to US pharmacies – meaning we can expect re-filing for the biosimilar glargine in 2019. Lilly’s URLi (ultra-rapid insulin lispro): Topline results released in October 2018 demonstrated non-inferiority on A1c reduction and superiority on 1- and 2-hour postprandial glucose vs. Humalog, in both PRONTO-T1D (n=1,222) and PRONTO-T2D(n=673). Lilly hasn’t revealed whether URLi gave superior A1c reductions vs. Humalog (the company couldn’t say whether this was purposeful or whether the data was not available), which is the piece of data we’re most looking forward to in 2019. Regulatory filing is also anticipated broadly in 2019. Sanofi’s SAR341402 (rapid-acting insulin): The GEMELLI 1 trial in both type 1 and type 2 diabetes is set to complete in January 2019, and regulatory submission is also slated for 1H19. Novo Nordisk’s Xultophy (insulin degludec/liraglutide): We anticipate an FDA decision on the inclusion of data from LEADER (CV benefit with liraglutide) and DEVOTE (40% reduced risk of severe hypoglycemia vs. Sanofi’s Lantus) on Xultophy’s US label in 1Q19. EMA approved an equivalent update for Xultophy’s European label in 2Q18, but we’re less certain the US agency will be receptive to the request. Novo Nordisk’s Fiasp (faster insulin aspart): In September 2018, Novo Nordisk submitted an NDA for Fiasp in Japan, following expiry of NovoLog’s 15-year Japanese price protection in April. A Japanese FDA decision should come in 2019. Lilly’s Trulicity (dulaglutide): Following topline release of positive results from the REWIND CVOT, full results are anticipated at ADA 2019 in San Francisco and results will be submitted to regulatory agencies in 1H19. The once-weekly GLP-1 demonstrated significant cardioprotection, but we know few details to date – including whether the effect was seen in the majority (69%) primary prevention cohort. The phase 3 AWARD-11 study of high-dose dulaglutide (3.0 and 4.5 mg) is expected to complete in October 2019 and follows strong phase 2 results presented at ADA 2018. Results could support an expanded dose range for Trulicity, translating to greater efficacy on A1c lowering and weight loss. Novo Nordisk’s oral semaglutide: With topline results from all ten phase 3 PIONEER studies released, Novo Nordisk is on track to submit the first-ever oral GLP-1 to regulatory authorities in 2019. We’ll keep our eyes and ears peeled for any news on the planned superiority-powered CVOT for oral semaglutide. AZ’s Bydureon (exenatide once-weekly): In the US, an sNDA for inclusion of EXSCEL data on the product’s label was submitted in 2Q18; an FDA decision should come in 1H19. Via a positive CHMP opinion in September 2018, the product’s EU label now includes CV data from EXSCEL. Lilly’s tirzepatide (dual GIP/GLP-1 agonist): Following presentation of highly compelling phase 2b results at EASD 2018, Lilly will continue to initiate the eight-study phase 3 SURPASS program in early 2019. Lilly will also initiate a four-study phase 3 program in obesity and a phase 2 study in NASH in 2019. Sanofi/Lexicon’s Zynquista (sotagliflozin): An FDA Advisory Committee meeting on Sanofi/Lexicon’s NDA for sotagliflozin in type 1 diabetes is scheduled for January 17, 2019, and the agency has a target PDUFA date of March 22, 2019. A decision should come from EMA around the same time, in 1Q19, and our understanding is that EMA has met to discuss both sotagliflozin and dapagliflozin for type 1 diabetes. AZ’s Farxiga (dapagliflozin) in type 1: An EMA decision on AZ’s 1Q18 filing for an expanded Forxiga indication, in adults with type 1 diabetes, is anticipated in 1Q19; a decision from the Japanese FDA should come around the same time. Following 4Q18 filing in the US, we don’t strongly expect a decision from FDA until much later in the year. AZ’s Farxiga (dapagliflozin) in type 2: In 1H19, AZ will submit results from the DECLARE CVOT to regulatory authorities, in order to gain a CV indication for the SGLT-2. As presented at AHA 2018, DECLARE demonstrated significant improvement on a primary composite of hospitalization for heart failure and CV death in a majority primary prevention population, and much remains to be seen as to what precise indication the company will seek. Farxiga has received a positive CHMP opinion for an expanded indication based on results from the DERIVE trial, which examined safety and efficacy in patients with type 2 diabetes and stage 3A CKD (moderate renal impairment – down to 45 ml/min/1.73 m2). Currently, FDA does not recommend the therapy for patients with an eGFR <60 ml/min/1.73m2 and is also reviewing DERIVE for a similar update in the US. The Dapa-HF outcomes trial of Farxiga in heart failure with reduced ejection fraction, with or without diabetes, is scheduled to complete in December 2019. J&J’s Invokana (canagliflozin): Topline results from the CREDENCE renal outcomes trial in type 2 diabetes are anticipated early in 1Q19. CREDENCE was stopped ~one year early, as announced in July 2018, because canagliflozin met its primary endpoint ahead of schedule. J&J will also roll out Invokana’s new FDA-approved CV indication, for reducing risk of three-point MACE in secondary prevention patients, in 2019. Sanofi/Lexicon’s sotagliflozin for type 2 diabetes: The first data readouts from Sanofi/Lexicon’s 11-trial phase 3 program for dual SGLT-1/2 inhibitor sotagliflozin are expected in 1H19. Submission of sotagliflozin for a type 2 indication is currently planned for 2H19, with FDA submission to follow in early 2020. Merck/Pfizer’s Steglatro (ertugliflozin): The VERTIS CVOT for the newest member of the SGLT-2 inhibitor class is scheduled to complete September 2019, and topline results could be available within the year. Xeris’ G-Pen glucagon autoinjector: Xeris filed its G-Pen with FDA in 2Q18 and has announced a PDUFA date of June 10, 2019. Lilly’s nasal glucagon: Lilly submitted its next-gen nasal glucagon to FDA and EMA in ~2Q18, meaning decisions from both are anticipated in ~2Q19. Zealand’s dasiglucagon: Zealand remains on track for 4Q19 regulatory filing of its dasiglucagon autoinjector in the US and EU, pending results from a phase 3 peds trial and following very positive phase 3 adult results. Lilly/BI’s Tradjenta (linagliptin): Topline results for the CAROLINA CVOT comparing Tradjenta to sulfonylurea glimepiride are expected in early 2019. Neutral results from the CARMELINA CVOT were presented at EASD 2018. Sanofi/Regeneron’s Praluent (alirocumab): A decision on a potential CV indication from EMA is expected in 1Q19 and from FDA in 2Q19. Sanofi/Regeneron submitted an sBLA/Type II Variation application to FDA and EMA in 2Q18, based off of positive results from the ODYSSEY Outcomes trial. Peruse our collection of therapy-related competitive landscapes. On each page, you’ll find a table of all candidates in development for that category, to the best of our knowledge. We frequently update these competitive landscapes as timelines change and as new developments arise. If 2017 was a year for CGM “momentum,” 2018 was unquestionably a year for CGM “milestones.” We estimate CGM may now be used by roughly ~1.5 million people globally, with global sales nearing $3 billion in 2018 and accelerating to over 70% YOY growth. The field seems to be reaching a real inflection point in sales and user base growth – see below. The global CGM user base has nearly doubled from the midpoint of our estimate one year ago (0.7-1 million), led by a remarkable >1 million FreeStyle Libre users globally on >$1 billion in expected sales. Libre alone has more than doubled its global user base from >450,000 users in late 2017. Dexcom is also growing fast, propelled by G6’s earlier-than-expected launch with factory calibration – we estimate roughly 375,000 global Dexcom users on expected 2018 sales of ~$975 million (+36% YOY). Dexcom held its first Investor Day in December, laying out a five-year vision to at least double sales within its existing target markets – to say nothing of the huge promise in non-intensive type 2 diabetes with the Verily low-cost, disposable CGM (initial launch by end of 2020). A big Medtronic milestone came in 3Q18, when management announced that CGM sales are now larger than its pump sales – this puts Medtronic’s estimated CGM sales in 2018 at roughly ~$700-$800 million and possibly more, driven by >135,000 active/trained users on the MiniMed 670G/Guardian Sensor 3 and June’s US launch of its standalone CGM, Guardian Connect. The sales milestone signals Medtronic’s shift to a CGM company that happens to sell pumps, rather than the other way around. And though it’s still early in Senseonics’ commercial history, the company had a strong 2018, moving quickly from a positive FDA advisory committee in March to FDA approval in June to its first US Eversense insertions (90-day wear) in late July and launch of the 180-day Eversense CGM outside the US. It was notable to see for the first time in our model that international CGM sales now slightly exceed US CGM sales (both estimated), though both geographies saw clear acceleration in 2018. Chart assumptions: includes 4Q18 estimated sales for Abbott, Dexcom, Medtronic, and Senseonics based on either 3Q18 guidance or conservative growth projections. Sales for Medtronic and Abbott are estimated for all five years shown, based on conservative assumptions and management commentary. Dexcom and Senseonics sales are based on quarterly calls from 1Q14-3Q18 and the most recent full-year 2018 guidance. The category’s acceleration signals that CGM may finally be moving from an early adopter technology to a broader user base, especially with four excellent sensors on the market (all four with smartphone apps), two factory calibrated sensors, balanced US and OUS momentum (especially OUS sales for FreeStyle Libre), two AID systems in the US (Medtronic and Tandem), rising clinician enthusiasm for the value of CGM and financial feasibility of incorporating it in their practices, more calls for outcomes Beyond A1c, and a move to interoperability (see next theme). In the US, the standalone CGM product landscape doubled from the start of the year to the end (two to four products). Notably, all four current CGMs on the US market were not even available at the start of 2018 – Abbott FreeStyle Libre 14-Day version, Dexcom G6, Medtronic Guardian Connect, and Senseonics Eversense. While the chart above shows OUS sales overtaking the US in 2018, the US still saw an acceleration in CGM sales in 2018. The market is unquestionably more competitive than ever, which will drive faster innovation in 2019 and beyond – especially as CGM data becomes better integrated into the device and clinical ecosystem. Hopefully the competition can drive better access too, since the field needs as much innovation in hardware/software as it does in paying for technology – particularly for type 2 diabetes, where CGM penetration is close to zero. More than prior years, 2018 had plenty of unexpected CGM news, including: G6’s interoperable/integrated CGM 510(k) clearance with factory calibration in March (iCGM was very unexpected, and factory calibration was originally expected by the end of 2018); FDA approval for FreeStyle Libre 14-day/1-hour warmup in July; and a CE Mark for FreeStyle Libre 2 in Europe in October (neither 14-Day nor Libre 2 was pre-announced as under regulatory review). There was long-expected regulatory news too, including Medtronic’s Guardian Connect/Sugar.IQ approval in March and Senseonics’ Eversense approval in June. All four of these standalone CGMs have smartphone apps too, laying a foundation for a thriving ecosystem around continuous glucose data. In a remarkable 2018, Abbott added more new FreeStyle Libre users than Dexcom’s entire estimated global installed base. The charts below show the companies’ respective user base cadence over the past five years, with two important caveats: (i) Abbott and Dexcom don’t share how they characterize a “user,” which means these are only loosely comparable – e.g., it’s possible that Abbott is more generous in counting a “user” than Dexcom; and (ii) Dexcom has not given an installed base update in nearly a year, so our estimate of roughly ~375,000 global users could be too low (it’s estimated from December’s Investor Day). It’s interesting that Dexcom and Abbott global CGM sales are nearly comparable (roughly ~$1 billion each, though we estimated Abbott’s as the company does not break it out) – that means Dexcom could be generating more than double the revenue per-user globally. Can Dexcom sustain this pricing and for how long? (Dexcom has been clear that per-user revenue will go down as it moves to the pharmacy channel with G6; see its Investor Day.) On the user base front, Abbott has had much more time to market a factory-calibrated sensor (five years vs. 0.5 years for Dexcom), and in Europe, Abbott has the huge advantage of online direct-to-consumer ordering without a prescription. 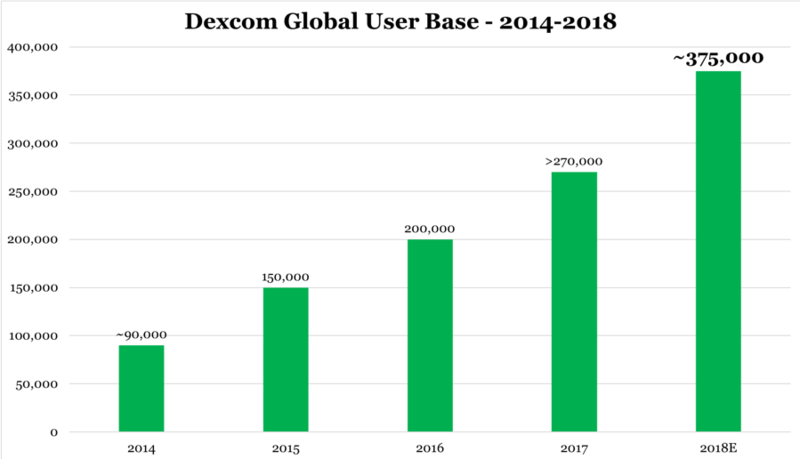 Will Dexcom pick up steam on the user base front in 2019, or will the real acceleration occur down the line as the company moves more intentionally toward providing CGM for non-intensive patients? Where does the CGM category need to go? More real-world CGM data on the “state of diabetes,” similar to T1D Exchange data on A1c – what is average time-in-range in type 1 and type 2 diabetes in these massive global CGM data sets? What is average time-in-hypoglycemia and time-in-hyperglycemia? How do these “time-in-ranges” metrics correlate with meaningful long-term outcomes? The field needs to identify benchmarks, which will help define what is a clinical meaningful improvement in time-in-range. More studies around use of real-time CGM vs. professional CGM – who will benefit from one vs. another? In the case of real-time, what is the right cadence in type 2 diabetes? What are the right levels of decision support, human coaching, and other interventions for various types of patients? More “Bright Spots” analysis – products should also alert CGM users when they are doing well (“Nice – your time-in-range today is the highest in the past week!”) expanding on the current focus on when things go wrong. A number of logistical questions about an interoperable ecosystem remain: Should AID algorithms remain class III devices that talk to class II iCGMs and pumps? What device modifications will manufacturers need to share with each other, and when? What product liability challenges come up with interoperable automated insulin delivery? Who is responsible if something goes wrong, and how are these events handled? At the same time, JDRF, Tidepool, Helmsley, and Insulet are leading the charge to bring algorithms developed by the DIY community to a larger audience under FDA oversight, leveraging in-warranty devices and plug-and-play interoperability. The vision could be a true paradigm shift for the field and unlock faster innovation than we’ve seen to date. The big interoperability news of the year came from Tidepool in October, when it announced plans to take the DIY Loop app through FDA and to market. Tidepool Loop has big implications for the future of AID, opening up a new regulatory and commercialization pathway comprised of three individual, interoperable components, rather than one complete “system” under a PMA. For pump and CGM companies, Tidepool Loop brings another option to launch with automation (once approved): make your individual pump or CGM device compatible with Loop, instead of (or in addition to) internally building/submitting your own three-component AID system. Thus far, these efforts will be supported by JDRF and Helmsley ($6 million in funding), Helmsley ($1.5 million in additional funding to conduct a Jaeb-coordinated observational study of Loop starting in early 2019), and Insulet (the first pump partner). Tidepool is in talks with other pump manufacturers about joining forces, but Insulet deserves huge credit for being the first to commit, even positioning this launch “potentially” before its own 2H20 launch of Horizon. It has not yet been announced, but Dexcom seems to be the obvious (first) CGM partner for Tidepool Loop. Tidepool is also uniquely positioned to take on this project, given that it has so many employees on DIY insulin delivery and since it’s a pilot participant in the FDA’s Digital Health Precertification program. The interoperable vision is certainly compelling: allow patients to pick from a variety of compatible CGMs and pumps, go onto the App Store to download a prescribed algorithm like Loop, and then seamlessly connect the components like a consumer device. Six years ago, the thought of getting CGM data direct-to-smartphone was still uncertain; now, the vision is an interoperable device ecosystem with smartphone hybrid closed loop apps at the center. Kudos to the visionaries in FDA, industry, nonprofit, and of course the DIY community! JDRF’s call for “open protocol” pump development, announced toward the end of 2017, was answered in a big way in 2018: Roche, SOOIL, SFC Fluidics, and Ypsomed all signed on this year. All of these manufacturers (and we’d throw Insulet in too) are designing pumps for seamless connectivity with other devices and smartphone apps. Will more pump companies sign on in 2019? JDRF’s Dr. Aaron Kowalski, Helmsley’s David Panzirer, and Tidepool’s Howard Look have all underscored industry’s buy-in on the concept of interoperability. At the JDRF/Helmsley meeting in April, Mr. Panzirer challenged the audience to consider if there is really a benefit to having a closed-off, proprietary system: “Ask yourself, is it a competitive advantage or just something leftover? If you ask me, in the future that may come back to bite you.” Dr. Kowalski added, “I can virtually guarantee someone will come along with a cheap pump, and they will plop algorithms in, and that’s what I’d be thinking about if I were in your shoes.” Indeed, a mix-and-match system would change financial and service models, but all in the name of patient choice, faster innovation, and regulatory flexibility. It will be interesting to see if interoperable/plug-and-play, distributed component systems (open) offer a better experience than closed systems with end-to-end development – both approaches have pros and cons. Open systems (e.g., Tidepool Loop) maximize patient choice and should enable faster innovation, but may require more partner coordination and put more onus on the consumer to navigate stitching together different products. Closed systems (e.g., MiniMed 670G) might enable easier business models and simpler customer experiences (one supply order), but are likely to innovate slower. Less tech-savvy consumers may also be intimidated at the prospect of a system that was not designed and tested specifically to work as a unit. If will be fascinating to see where companies fall on the spectrum, and what the market and payers prefer. What other bigger questions are on our minds regarding interoperability? Where will the field be at this time next year? Will there be any additional iCGMs? How many iPumps will there be? What will be the regulatory perspective on iControllers? How would an iController be evaluated? Could a software sponsor run a trial with any iCGM and iPump for regulatory approval? What will be the role of simulation? How many manufacturers will continue to study and develop their own closed AID systems (e.g., proprietary/partnered algorithm, pump, and CGM) vs. providing individual components to an interoperable system? Will more companies follow Insulet and take both routes? Will there be a more robust interoperability discussion around smart pens and open loop insulin dosing support (“iPen”)? What proportion of patients would prefer to pick and choose their components rather than a system that has been studied as a whole and is supported by a single manufacturer? How many device partners will Tidepool Loop have? For the first time ever, our Automated Insulin Delivery Competitive Landscape was the year’s #1 most-read Closer Look report. The field saw many moves in 2018, including more commercial scale with the MiniMed 670G (>135,000 active users, OUS and pediatric launches); US launch of the first no-fingersticks, remote-software-updateable AID system, Tandem’s Basal-IQ; OUS regulatory progress, with CE Marks for both 670G and Diabeloop; progress on next-gen advances, including smartphone control (Insulet, Bigfoot, Tidepool Loop) and automatic boluses (Tandem Control-IQ pivotal, Medtronic Advanced HCL); an inklings of new business models for the field (670G Performance Guarantee, Tidepool Loop). We expect 2019 will mostly be a transition year for the field, with the biggest launch expected early in the year for Diabeloop (starting in France) and in summer 2019 in the US for Tandem’s Control-IQ/Dexcom G6 hybrid closed loop. Beyond commercialization, 2019 should see several systems advance towards/into pivotal studies, including Tidepool Loop’s observational study (start early 2019), Bigfoot Biomedical/Abbott (2Q19 pivotal start), Insulet’s Horizon (pivotal seems likely in 2019), Beta Bionics’ insulin-only iLet (2H19 pivotal start), and possibly Lilly’s hybrid closed loop. For now, 2020 is still when a flurry of systems plan to come to market, leaving 2019 mostly up for grabs between Medtronic and Tandem. See below for a company-by-company recap, followed by some perspective on where the AID field needs to go. See our recently updated AID competitive landscape here. Following a challenging 2017, Medtronic scaled the MiniMed 670G nicely in 2018 – a six-fold increase in users, pediatric indication (ages 7+), European launch, and a bold payer guarantee. The MiniMed 670G user base has risen from 20,000+ US users this time last year to 135,000+ worldwide users as of November 2018. This year, the first-to-market hybrid closed loop secured a CE Mark (June), FDA approval for pediatrics (7-13 years; June), Health Canada approval (October), and a European launch in select countries (October-November). A 2-6-year-old US study of 670G recently wrapped up, paving the way for further age expansion. Big news on the business model side was the $25,000 670G Performance Guarantee, which launched in June – the program promises that if there is a diabetes-related hospitalization or ER visit for a patient on the 670G, Medtronic will reimburse a payer up to a cap of $25,000 over a four-year period. No other company has promised this kind of guarantee (and may not have the means to do so at this point) – will it prove to be a significant advantage? On the pipeline, 3Q18 moved up timing on Medtronic’s advanced hybrid closed loop with automatic boluses (>80% time-in-range goal) and possibly Bluetooth connectivity, now expected to launch by April 2020. Closing out 2018, Dr. Fran Kaufman’s retirement is a huge loss for Medtronic’s closed-loop efforts, though a strong foundation has certainly been built. Relative to one year ago, Medtronic: (i) fixed the Guardian Sensor 3 manufacturing shortage on time and quickly scaled; (ii) launched the 670G outside the US ~6 months later than expected; and (iii) launched the pediatric indication in the US quickly (no launch plan had been shared this time last year). Tandem had an impressive year on the AID pipeline front, submitting Basal-IQ in 1Q18 with Dexcom’s G5, receiving approval in June with G6/iCGM compatibility, and launching in August with a free remote software update for t:slim X2 users. Quickly after its first-ever Analyst Meeting (September), Tandem submitted the t:slim X2 as the first integrated/interoperable iPump to FDA, which would fit nicely with the Dexcom G6 iCGM, help with potential Tidepool Loop integration (assuming Tandem decides to integrate; we think it should), and simplify the next-gen miniaturized t:sport regulatory path. The Control-IQ hybrid closed loop pivotal trial is fully enrolled, and the system is expected to come to market in Summer 2019 with automatic boluses for hyperglycemia and the factory calibrated G6. 3Q18 saw record sales for Tandem, momentum we expect to continue into 4Q18 and 2019 – reviews of Basal-IQ/G6 continue to be quite positive, Control-IQ will offer some clear advantages over 670G in the US (no calibration, auto boluses, remote monitoring), and users getting on t:slim X2 now have the assurance of a software update once Control-IQ is ready. Direct smartphone control for t:slim X2 is expected before the miniaturized t:sport pump launches in 2H20, slightly ahead of Insulet’s Omnipod Horizon (see below). Relative to one year ago, Tandem: (i) launched Basal-IQ right on time for summer 2018, with the added bonus of G6 integration; (ii) started the Control-IQ pivotal on time (1H18); and (iii) stretched out timing for Control-IQ, which has moved back from “1H19” to “Summer 2019.” Tandem definitely wins “most improved” award from the start to the end of 2018. Relative to one year ago, Diabeloop is about one year behind its plan for an “early 2018” launch. In October, Tidepool announced bold plans to submit the DIY Loop app to FDA, paving a new regulatory path for automated insulin delivery (AID). Loop will be made available as an officially supported, FDA-regulated mobile app on the iOS App store, rather than the current unregulated DIY version that only works with out-of-warranty Medtronic pumps. Tidepool Loop aims to be compatible with commercially available interoperable insulin pumps and CGMs, with Insulet’s Omnipod on board so far. (Dexcom and Tandem seem the most likely next in line, if we had to guess.) A virtual, Jaeb-coordinated observational study will begin in “early 2019,” aiming to collect real-world safety and efficacy data from ~150-300 current Loop users. Loop’s regulatory path, speed to market, customer support, and number of integrated devices are still question marks, though this platform has an outstanding user experience foundation and more current users (1,000+) than any commercial product at a similar stage. The $6 million vote of confidence from JDRF and Helmsley earlier this month provides great tailwind – will other companies sign on in 2019? One year ago, Loop was a DIY-only solution without a commercial path to market! This has easily been the most unexpected change in the AID landscape since late 2017. Insulet’s own Horizon closed loop is slated for a 2H20 launch with direct smartphone control – i.e., the algorithm will be on the tubeless pod, a Dexcom G6 sensor will talk to the pod, a user will remain in closed loop when the phone is out of range, and system interaction (including bolusing) will take place from Insulet’s app on his/her own smartphone. Notably, Horizon was recently granted FDA breakthrough device designation, enabling an expedited development path and “accelerated review and approval.” Additional integration with Tidepool’s Loop (see above) gives Omnipod users choice of automated system (Loop or Horizon) and gives Insulet two AID irons in the fire. A fourth IDE study (pre-pivotal) of Horizon will test real-world, challenging scenarios with missed/large meals, exercise, etc. (n=20-30). We’d guess a Horizon pivotal would start sometime in 2019, though specific timing has not been shared. Insulet is leaving the year in a strong competitive position on the AID front. Relative to one year ago, Insulet has: (i) added Tidepool Loop integration (see above); and (ii) pushed back Horizon’s launch timing by ~6-12 months, from the previous “end of 2019/early 2020” plan to the new 2H20 timing. On the plus side, Horizon has added direct smartphone control. Bigfoot laid a solid foundation in 2019, headlined by completion of a Series B round of financing ($55 million) and a strong product vision shared in CEO Jeffrey Brewer’s FFL 2018 presentation. As of the last update, a pivotal of the Loop system was expected to start in 2Q19 (14 years old and up), using a next-gen Abbott FreeStyle Libre CGM with continuous communication via Bluetooth (we’ve been internally calling this FreeStyle Libre 3, as the new Libre 2 in Europe is still not continuous real-time transmission). Bigfoot’s Inject system (MDI auto-titration) is also expected to launch in 2020. At Friends for Life, we were impressed with the first glimpse of Bigfoot’s monthly supplies packaging, as well as its truly ambitious plan for a portfolio of device offerings ranging from type 2 basal-only (BGM/smart pen cap/app) to full AID. The central product vision remains the same: a smartphone app that serves as the window to the system and complete user interface, a no-screen pump with an embedded control algorithm, and direct CGM-to-pump communication (i.e., users will remain in closed loop even when the phone is out of range). Prefilled insulin cartridges are another huge plus of the design. Bigfoot continues to focus on extensive simulation and modeling, with plans to jump straight to a pivotal trial after one small in-clinic feasibility study presented over a year ago – can it successfully execute on that plan? We remain optimistic about Bigfoot’s vision to shake-up the business and service models of pumps and AID with a single-prescription, monthly subscription model, and reimbursement based on outcomes. Relative to one year ago, Bigfoot’s US pivotal trial for Loop is ~6-12 months delayed – from “2018” to the now-planned “2Q19” start. However, the anticipated “2020” launch timing remains intact, and Bigfoot’s portfolio vision has expanded considerably in scope. Beta Bionics also put key building blocks in place this year, raising $50 million in Series B financing, working to finalize its dual-chambered iLet Gen 4 pump, and adding Senseonics Eversense CGM to its compatible devices. An insulin-only pivotal study is expected to begin in 2H19, with FDA approval expected in 2H20 (pediatrics and adults). Home-use bridging studies have been completed at Stanford (Dexcom CGM) and MGH (Eversense 90-day CGM). We first saw the much-improved Gen 4 iLet device at Friends for Life, which was followed by an NIDDK grant in October (up to $2 million) to further design and develop the device. The Gen 4 iLet will be compatible with Novo Nordisk’s Fiasp insulin in the prefilled PumpCart, prefilled Zealand dasiglucagon, and a manual-fill glass insulin cartridge (1.6 mL, Humalog, Novolog). In adding Senseonics, Beta Bionics became the first AID player working with two commercial CGMs. The bihormonal pivotal study with Zealand’s dasiglucagon is now expected to start in late 2019/early 2020, with approval targeted for 2022 (depending on FDA CDER progress). The simple system startup, optional meal announcement (and qualitative entry), potential for insulin-only or insulin/glucagon, and prefilled reservoirs remain very attractive features of this system. Relative to one year ago, Beta Bionics pivotal studies are now ~6-12 months later than expected. These were previously both targeted for the beginning of 2019. However, the team did a great job of improving its device design in 2018, raising funds, and adding Senseonics Eversense CGM. At its Cambridge Innovation Center in May, Lilly showed off its in-development hybrid closed loop: a tiny disc-shaped tubed pump with no screen, an app/wireless controller with the user interface, and Dexcom’s G6 CGM. At its financial analyst meeting this month, a slide positioned Connected Care launches in a cadence over the 2019-2021 three-year period – it was not specified where the hybrid closed loop launch would fall in that window. In our first in-person look, Lilly’s pump was smaller and slimmer than we expected – about ~two inches in diameter and a ~half-inch thick. The pump holds 100-300 units of insulin in a disposable reservoir that fits into a reusable, rechargeable-battery-powered pumping mechanism. Similar to Bigfoot, Lilly has gone with no screen on the pump – it has just one button for manual on-demand boluses, and will otherwise be controlled by a wireless handheld and/or a smartphone app (depending on regulatory progress). The control algorithm was licensed from Montreal-based Class AP. Lilly is also building smart pen dose capture devices that fit onto the disposable KwikPen, talk to an app, and give dose recommendations based on CGM/BGM; these are also targeted for the 2019-2021 launch window, with the connected pen to be submitted to FDA in 2019. Lilly has a special setup with the Cambridge center and the leadership of Ms. Marie Schiller and Dr. Howard Wolpert will ensure a lot of patient- and HCP-driven design – will we hear more public updates in 2019? Relative to one year ago, Lilly’s connected care launch timeline has broadened by one year – now a 2019-2021 launch window, back from the initial late 2019-late 2020 plan. The company has not shared any feasibility data so far (at least one study complete), nor given any pivotal study plans for the hybrid closed loop. The summit in May and comments this month emphasized that Lilly's efforts are meaningful, consumer-grade, and quite far along. As of November, the Roche/Senseonics/TypeZero AID pivotal study was expected to begin by the end of 2018. This will use the Roche Accu-Chek Insight pump with Senseonics Eversense XL CGM (180 day implantable) and TypeZero’s inControl algorithm (now owned by Dexcom). Roche was the first to join JDRF’s Open Protocol Initiative in 2018 – might it integrate with Tidepool Loop? Relative to one year ago, this pivotal trial is about ~9-12 months behind schedule – from an expected “early 2018” start to the currently planned “end of 2018” start. More companies are covered in our AID Competitive Landscape, including Cellnovo, EOFlow, Ypsomed, SOOIL, WaveForm (AgaMatrix), and SFC Fluidics. Where Does the AID Field Need to Go? More AID studies in new populations – pediatrics, elderly, newly diagnosed, people with recurrent severe hypoglycemia, people with complications, pregnancy, type 2 diabetes, hospital, etc. Simplified user experiences – around system startup, meal entry and adaptation, ongoing n=1 personalization, prefilled insulin, etc. More head-to-head studies – of different companies’ systems against each other, of systems with different components, of traditional AID with a pump vs. MDI/decision support. More alternative business models – e.g., subscription, performance guarantees, rebates, etc. The smart insulin pen/pen cap landscape saw much more R&D and commercial movement this year, including a full-year for Companion Medical’s InPen, a limited launch for Common Sensing, and planned ~2019-2020 entries for Novo Nordisk and Lilly. Following a successful ~700 patient pilot of the NFC-enabled Novo Pen 5 Plus in Sweden, Novo Nordisk announced in October that it is set to launch two CE-marked, connected reusable pens (NovoPen 6 and Echo Plus) in Europe in early 2019. US timing for these reusable pens is unclear, though they could presumably launch in 2019 too. Later in 2019, Novo Nordisk intends to launch a reusable, Bluetooth pen attachment (cap, clip, sleeve?) for disposable, pre-filled FlexTouch pens. With this development, Novo Nordisk joined Lilly as a major insulin company developing its own smart pen hardware. Lilly has not given specific launch timing on its smart pens, though its Investor Day this month said that the pen would be filed with FDA in 2019 and its connected care products will launch in a cadence over 2019-2021 – this will include the “Integrated Insulin Management” system, comprised of a smart pen(s), G6 CGM, and an app providing dosing advice. Sanofi is working with Common Sensing’s Gocap in a pilot and we wouldn’t be surprised to hear of dose capture developments with Onduo (the Verily/Sanofi JV); however, Sanofi has not officially committed to a launch like Novo Nordisk or Lilly. We’re excited to see insulin manufacturers dive into smart pens, as these large companies can help build the category very quickly. For insulin manufacturers, connected products bring obvious benefits: faster and smarter titration (and therefore better outcomes), better information for HCPs, and better real-world data on how products are used. Ultimately, there may be more upside from innovation in insulin dosing data/decision support than in the molecules themselves. Plus, better use of data could drive more compelling payer contracts. We hope to hear more in 2019 from first-to-market Companion Medical (Lilly is an investor), along with news from Common Sensing (Sanofi is an investor/partner). Both Companion Medical – having received a CE Mark this year – and Common Sensing could be acquisition targets for their respective pharma investors; Lilly has not said whether it’s developing its own connected durable pen (which could be a boon in the European market), and Sanofi hasn’t spoken to any internal smart injection device development. These smaller companies will be critical for building the field alongside larger players, just as we’ve seen with CGM. Bigfoot now expects to launch its auto-titration injection system (“Inject”) in 2020, though has not shared pivotal trial timing. Like Lilly’s system, it will include a dose capture cap for disposable pens, a decision support app, and CGM data (in Bigfoot’s case, a next-gen FreeStyle Libre). According to CEO Mr. Jeffrey Brewer’s FFL 2018 presentation, the system will ultimately support use with (i) basal insulin-only and BGM; (ii) MDI and BGM; and (iii) MDI and CGM. That said, we’d guess all of those won’t launch in 2020, since they are different use cases. We are very excited about Bigfoot’s ability to drive significant software and user experience simplicity in injection titration, leveraging a lot of its algorithm learning on the hybrid closed loop front. A number of other players hope to soon be on the market, though a revolving door of potential entrants seems to come and go every year. Players on our radar include: Biocorp (expected 1Q19 EU launch and 3Q19 US launch), Insulclock (available in EU), Pendiq (distributed by Roche in Germany), Emperra (available in EU), and Diabnext (expected launch in November). At this stage, we do not have high confidence in any of these players. Novo Nordisk and Lilly stepped up in 2018 in terms of investing in the category, including building their own connected devices. This was huge progress relative to 2017 and is absolutely the right strategic move in our view – the upside from investing in adherence-boosting technology seems greater near-term than that of further improving insulin kinetics (short of glucose-responsive insulin). Plus, technology enables faster iteration and less expensive development cycles, relative to taking a drug all the way from preclinical testing to regulatory submission. However, the companies are taking slightly different approaches on the software side: Novo Nordisk is taking a partnership approach to connectivity, announcing a first batch of smart pen data partnerships with Dexcom, Glooko, and Roche; Meanwhile, Lilly is, to our knowledge, mostly building its software solo, though with the help of Dexcom on the CGM side and Rimidi on the HCP-facing side; finally, though Sanofi is not publicly approaching the market with its own hardware, it does have the My Dose Coach basal titration app FDA-cleared. (The US launch has been very limited, as indicated by download/review metrics on Apple and Android.) With these companies building out technology around their insulins, one has to wonder when we will start seeing more alternative payment schema on the table – how much technological investment, and in what form, will it take for an insulin manufacturer to feel more comfortable selling its insulin products with guaranteed outcomes or cost savings? A clear 2018 theme in diabetes coaching and remote care was horizontal integration, as numerous companies moved to offer services in areas beyond their original domains of expertise. Livongo acquired now-CDC-recognized DPP and weight management provider Retrofit (+ connected scale), and expanded its offering to support hypertension (including a voice-enabled blood pressure monitor); Omada expanded on its DPP to support diabetes and hypertension management; mySugr partnered with telehealth platform Care Innovations to expand access in the US and Canada; One Drop expanded into gestational diabetes and DPP; Virta presented positive prediabetes data at ADA (though its focus remains on reversing established type 2 diabetes); and WellDoc moved into hypertension and weight management. We have heard that payers are seeking a “one-stop shop” to manage diabetes and its many comorbidities. From an administrative perspective, managing one contract with one provider is clearly simpler for the plans/employers, and in conversations with leaders from these remote care companies, the core competencies for addressing different stages of diabetes (e.g., prediabetes and diabetes) and other metabolic conditions such as hypertension are similar. Indeed, lateral expansion doesn’t require drastic changes to the foundation of remote/connected care, and it opens up new segments of the market and makes feature sets more appealing to potential clients. Finally, we’d imagine users would prefer to interact with a single provider for diabetes and weight and hypertension, rather than a slew of different siloed apps and services. Remote diabetes care/coaching is gaining steam, as user bases from all of these companies are expanding. Roche’s mySugr claimed >1.4 million users as of February, One Drop boasts ~860,000 as of June; Omada has enrolled >150,000 in its DPP as of June; Livongo is over 100,000 users as of October; Canary has had 65,000 people go through its DPP and diabetes management programs as of August; and Onduo is in the low thousands in its pilot phase, but preparing to scale more broadly in 2019. We caution that the definition of “users/active users” is not standardized across all of these companies – though, ideally, it would be – so accurate head-to-head comparisons of scale are not possible. Moreover, all of these companies deploy “coaching” in different ways, and in cases like One Drop and mySugr, only subsets of the global user base are using paid coaching offerings. This year saw more diabetes technology integration with remote care – most excitingly, the introduction of CGM. Livongo partnered with Abbott to offer select patients Abbott’s FreeStyle Libre Pro, and Onduo is running select type 2 enrollees through real-time intermittent CGM “sprints” to help them learn the impacts of behaviors on their glucose levels. According to Onduo’s Head of Payer Relations Ms. Susanna Visuri Monacelli, participants across the board who had baseline A1c >9% regularly saw 2%+ drops by participating in Onduo’s program (the average was not shared), while those with baseline levels >9% and given real-time CGM often saw 3%+ A1c drops! The incorporation of intermittent CGM in remote care could result in step-function improvements in patient outcomes. Onduo has built a portfolio of curated technologies for its population: BGM (Telcare), CGM (Dexcom), insulin titration (Voluntis, Glytec), telemedicine (Amwell), education (Mytonomy), and foot care (Orpyx smart shoe insoles). We see great potential in this approach of partnering widely and then using continually-learning algorithms to determine which type of patient is most likely to benefit from specific interventions. Building on the randomized study of Welldoc’s Bluestar back in 2011 (Diabetes Care), we’re excited to see new RCTs to evaluate remote diabetes care programs: Omada (PREDICTS; DPP) and Livongo (SUGAR; Livongo for Diabetes). SUGAR is expected to read out in December 2019, with PREDICTS to follow in January 2020. We wonder: (i) Assuming strong outcomes are observed, will these be interpreted as class effects (“a rising tide lifts all boats”) or would Omada and Livongo get a leg up on the competition? ; (ii) How will the results compare to pharmacotherapy alone (specifically regarding Livongo), and if they are more powerful, then what impact will this have on the pharmaceutical sector? In the best case, medications, devices, and remote care would be personalized and curated to drive the best results. Virta presented very strong two-year data from its non-randomized, controlled study at Obesity Week. The data showed 10% body weight loss from a baseline of 250 lbs, a solid -0.9% A1c reduction (baseline 7.7%), a notable 54% of completers achieving “diabetes reversal” (A1c <6.5% + on no meds except metformin). Notably, only ~27% of the population was taking diabetes medications at two years (excluding metformin), down from 57% at baseline. One Drop was in the midst of wrapping up data collection for at least two RCTs (A-One, Fit-One) as of ADA – these trials compare a One Drop program with the same program plus either Afrezza or a Fitbit watch tracker – they aren’t designed to compare One Drop’s intervention vs. usual care. Omada shared positive data on its digital DPP for underserved populations at two-years. At ADA’s real-world data meeting, an Onduo poster shared the very first outcomes from the virtual diabetes clinic launch: a 1.3% A1c drop in individuals with baseline A1c ≥8%. A JMIR article showed that Canary Health’s Better Choices, Better Health diabetes program conferred significant return on investment ($2.00-$3.00 for every $1 invested). Livongo presented compelling cost-savings data at ADA – a 10% increase in the monthly Livongo usage rate was significantly associated with a 2.1% decrease in medical spending. A poster at DTM showed that use of the mySugr Bundle (mySugr app + unlimited strips + CDE coaching; n=52) dropped mean blood glucose significantly by 16 mg/dl (baseline: 154 mg/dl) and improved time-in-range significantly from 64.5% to 73.0% (+2 hours/day). DarioHealth presented three posters at ADA, showing use of its system to result in less hyperglycemia and severe hyperglycemia, and lower mean glucose. DarioHealth also announced that it will be working with LMC Health Care to provide coaching and digital content across Canada. In addition to interoperability (see theme #2 above), FDA approved/cleared a slew of new diabetes devices in 2018, including three without any predicates: Dexcom G6 (“integrated CGM”), IDx-DR (retinal diagnostic software device), and DreaMed Advisor Pro (insulin therapy adjustment device). If our memory serves us correctly, the last time diabetes tech saw a De Novo was for Dexcom Share secondary display – wow! That really puts into context the amount of new technology flying at CDRH from all angles – their hard-working team deserves a lot of credit for pushing the field forward. The most impressive single day of the year came on the eve of ADA, when our team was in transit, and we first received word that Senseonics’ 90-day implantable Eversense CGM was approved, then that Tandem’s Basal-IQ was approved for use with G6 less than an hour later, and finally that Medtronic’s MiniMed 670G was approved for children down to age 7. In other major regulatory wins in 2018, FDA cleared Insulet’s Omnipod Dash PDM approved Medtronic’s Guardian Connect with Sugar.IQ and Abbott’s 14-day wear, one-hour warmup sensor, and cleared Dexcom’s G6 Pro Q (professional CGM) and non-intensive app. Under the leadership of new Commissioner Dr. Scott Gottlieb, FDA was active this year in the areas of digital health and real-world evidence. The Digital Health Pre-Cert program – essentially TSA PreCheck for companies developing medical apps – began in earnest as an open-ended venture seeking public feedback at a workshop in January. Now, with nine pilot companies enrolled (most of which have connections to diabetes), FDA intends to release a working model by the end of 2018 (clock is ticking!) prior to a 2019 “test phase,” in which the program will be piloted and iterated accordingly. We’re excited to see the form that Pre-Cert takes in 2019 and beyond – a common sentiment expressed regarding digital health regulation is that “something’s gotta give,” as there’s no way FDA could possibly keep up with the deluge of digital products. Fortunately, the Gottlieb-led FDA is committed to reducing burden and driving innovation in this vertical. Dr. Gottlieb and co. are leaving no stone unturned, with plans to: (i) modernize the 510(k) program; (ii) streamline the De Novo process; and (iii) enhance use of real-world evidence. In the past five years, pumps have dominated the automated insulin delivery discussion. This year highlighted another critical frontier: decision support for people on injections, who comprise the majority of intensive insulin users globally. How closely can these MDI decision support systems approximate pump/CGM hybrid closed loop, and at how much lower cost? At DTM, we saw promising hypoglycemia data from the ongoing RCT testing CGM-based insulin dosing decision support in MDI users with Dexcom’s G5, TypeZero algorithms, and Novo Nordisk smart pens (NFC-enabled NovoPen5Plus and NovoPen Echo Plus). Dexcom’s acquisition of TypeZero could pave the way for a Dexcom-driven MDI insulin dose decision support app – complementing its partnership with Lilly. Meanwhile, Abbott is supplying a next-gen FreeStyle Libre for Bigfoot’s Inject MDI titration platform. Not missing a beat, Medtronic is also moving into the CGM + MDI ecosystem, announcing plans at its 2018 Analyst Day to launch a “Sugar.IQ Dosing Assistant” and insulin dose capture by April 2020. It’s unclear whether Medtronic will develop its own in-house dose capture solution or if it might partner with an existing company (e.g., Common Sensing, Companion Medical, etc.). Provider-facing decision support remains promising, but is waiting for the right business models, more widespread use of CGM, a non-traditional HCP acceptance curve, and bigger investment. DreaMed’s Advisor Pro secured FDA clearance this year for adjusting insulin pump settings, first based on CGM and then updated for SMBG data. We’ve heard very little about the limited launch within Glooko’s web-based Population Tracker. At EASD, Medtronic unveiled its new and improved provider-facing Pattern Snapshot 2 for professional CGM. Projected to launch to a small number of clinics in 4Q18, the second version of this clinical decision support software has been updated to include tailored therapy recommendations for oral diabetes drugs – a major win for making professional CGM more useful in type 2 diabetes. Helping PCPs manage people with diabetes more efficiently may prove to be one of the most critical public health projects of the next century – given the decrease in appointment duration and the simultaneous increase in data, building effective, easy-to-use solutions for physicians is more essential than ever. Other flavors of diabetes clinical decision support include Glytec’s Glucommander insulin titration software (very strong hospital outcomes in dual DTM posters) and Lilly’s Rimidi partnership (Rimidi’s software will integrate into clinicians’ workflows on top of EHRs, providing therapeutic guidance and identifying optimal treatment plans).